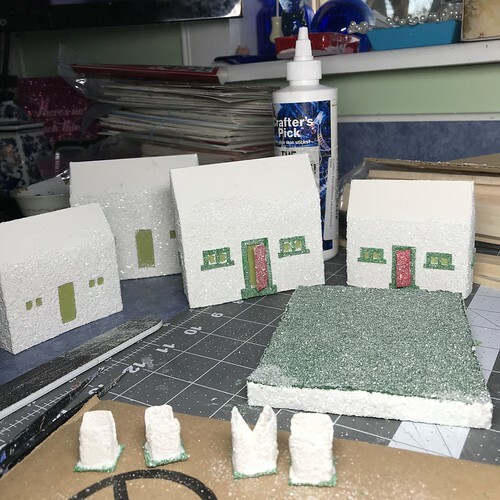 I spent most of the week working on Putz houses. 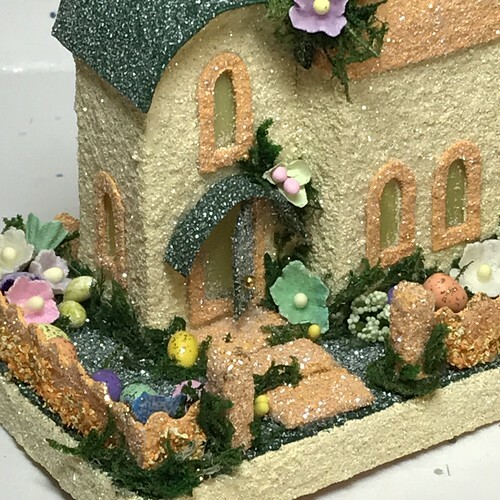 On Monday, this church was fully assembled and ready for embellishments. I made the pattern in two sizes. 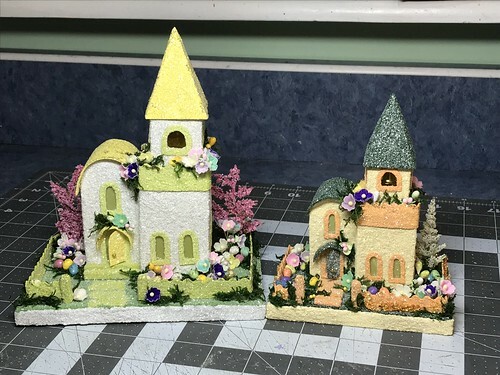 The church on the left is the full-size pattern. 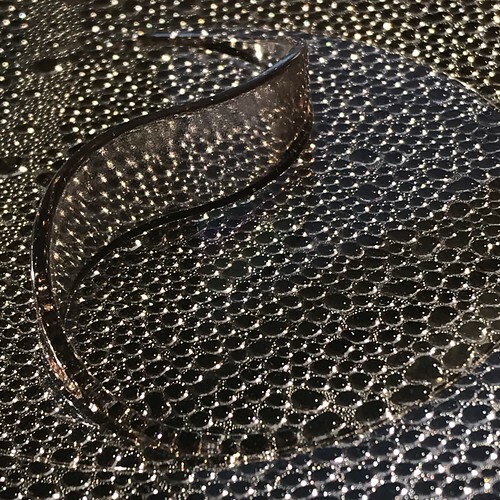 The one on the right was reduced to 80% of the original size. 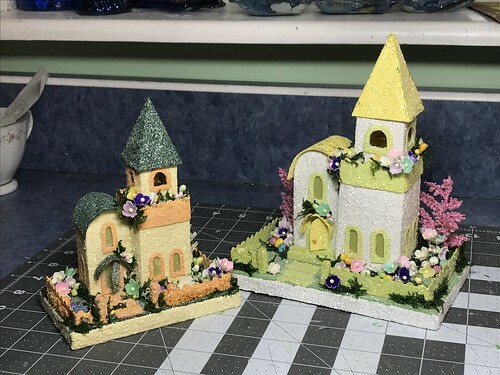 In addition to the churches, I made a couple of spring Putz houses. This is the mini version. When it was done, I decided I like the mini one so much that I am keeping it for my own collection. 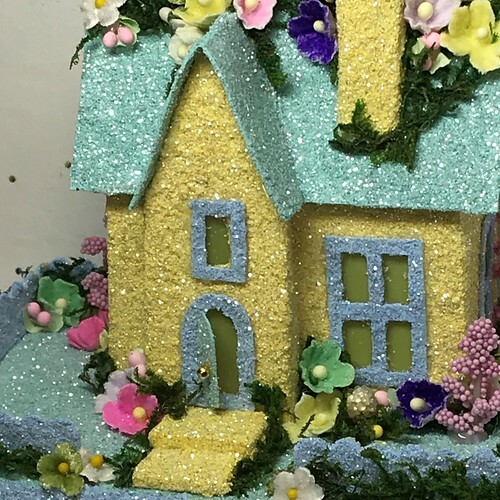 The second springtime Putz house is larger than the first. 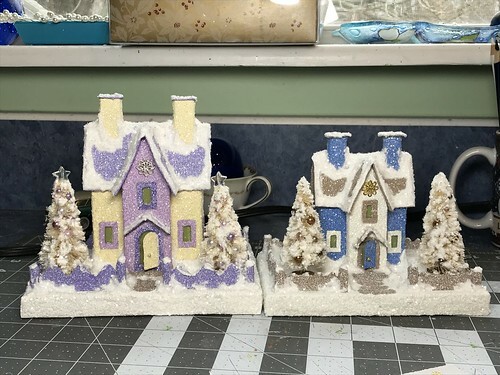 I was able to use the same yellow, but the green was less blue and the blue was more lilac than on the first house. 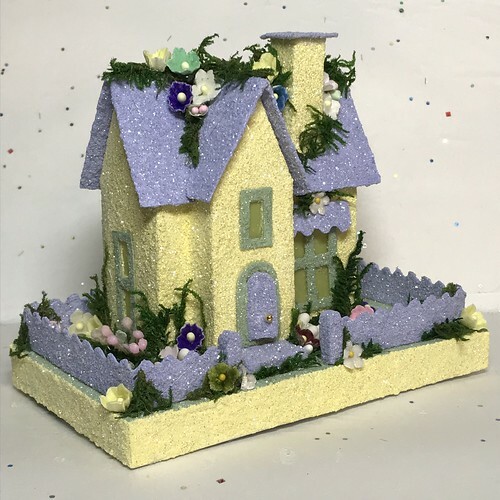 The house is embellished with mulberry paper flowers, velvet flowers and preserved moss. 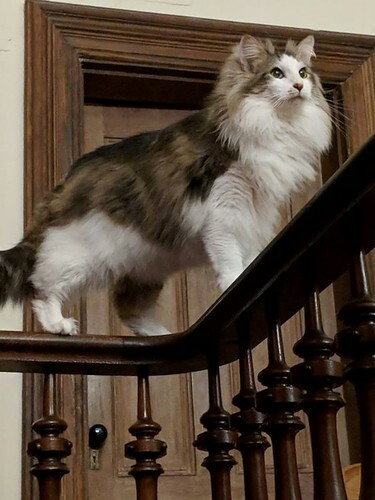 DH took this picture of Clark, king of the upstairs banister. He looks pretty noble, doesn’t he? By the way, he is standing over the staircase. It is a twelve foot drop to the first floor. But he doesn’t mind. This railing is one of his favorite places to hang out, even for a nap. We had asparagus at lunchtime. 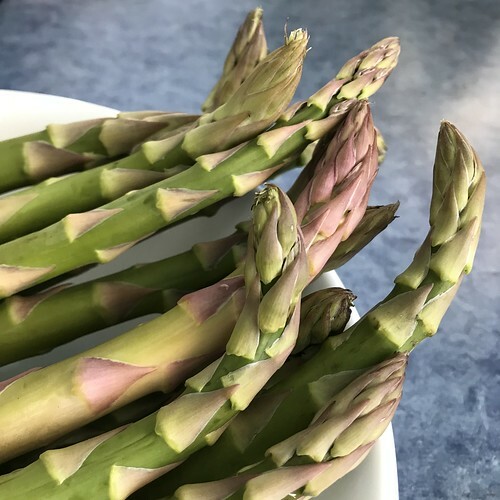 With our cold temperatures and very windy day, I was reminded that somewhere out there, it is warm enough for asparagus to grow. It won’t be long before spring is in full bloom here, as well. DH just brought in a picture he took in the back yard. Our first spring blossoms. Tiny crocus in the grass. This counts for spring! He also brought in some daffodils he dug up in the back yard. We should have blossoms soon! 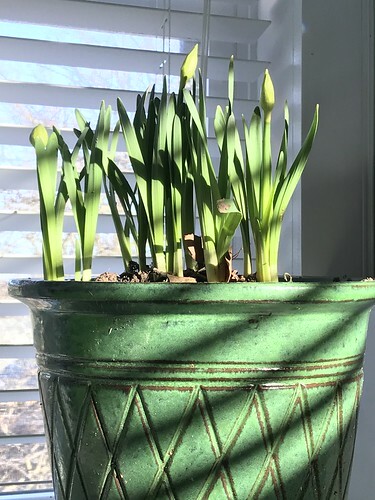 And soon, they will be blooming outside! 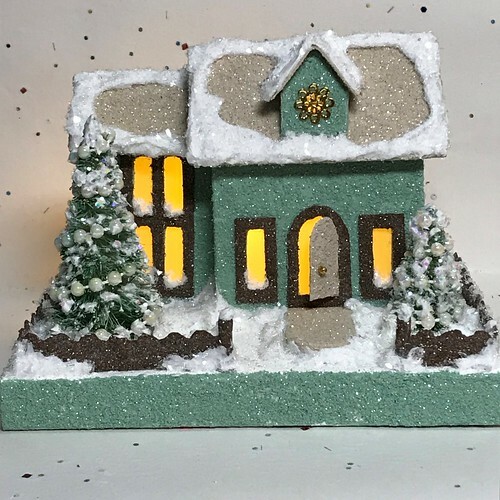 I love the miniature Putz houses and this one is a particular favorite. I love these colors and the pattern, as well. Pictures don’t do this little house justice. 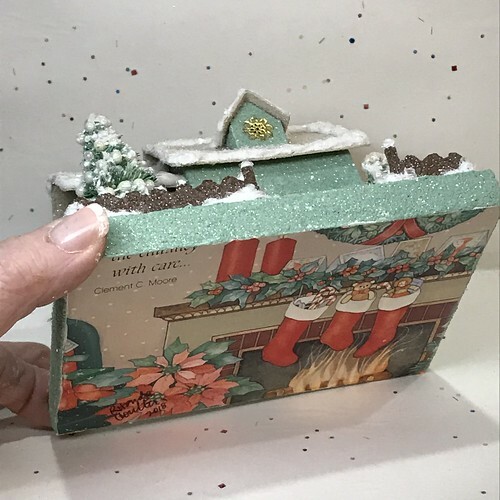 The base is made from an upcycled greeting card. As soon as I saw this card, I knew I had to make a Putz for it. 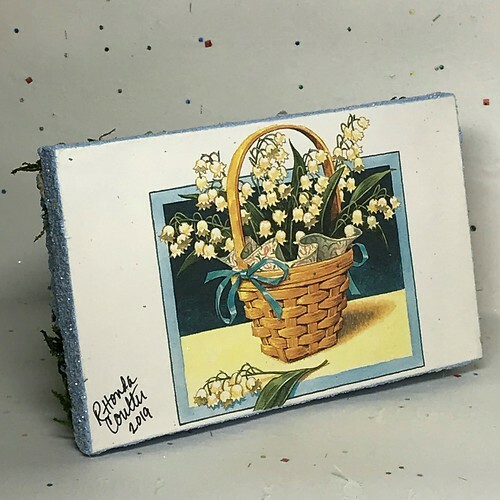 Lily of the Valley are one of my favorite flowers and it is also the flower of May, my birth month. May 24. Me and Queen Victoria. And Bob Dylan…DH is a fan. Me, not so much. 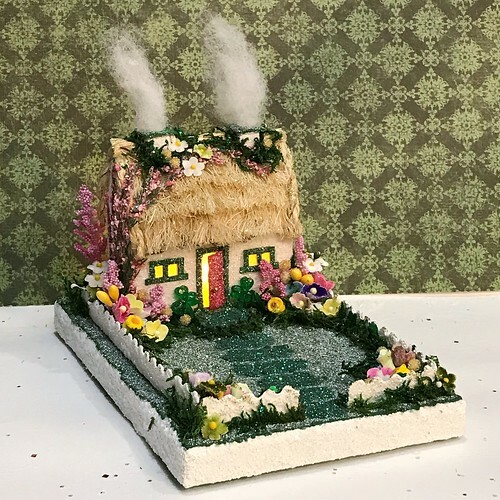 The little house is embellished with mulberry paper flowers, preserved sheet moss, and artificial foliage. 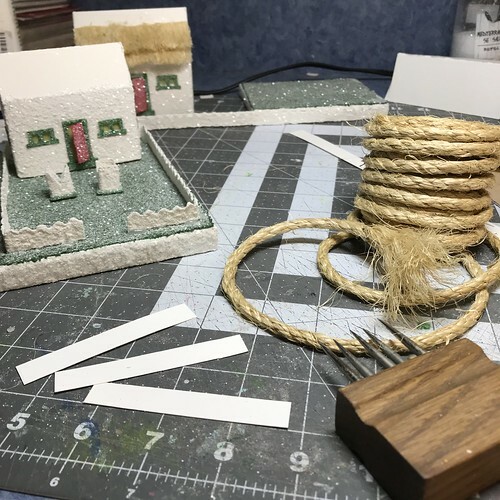 The front steps are made from balsa wood. 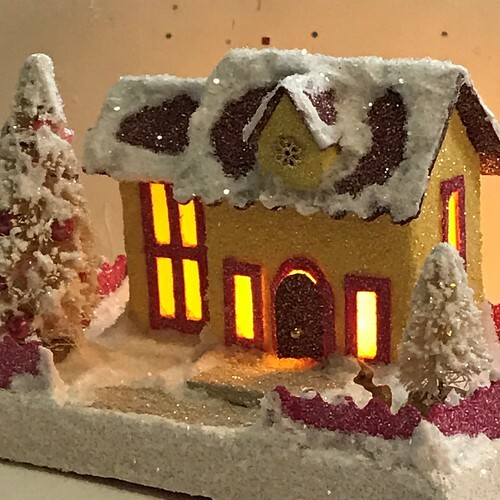 The back of the Putz house has the traditional hole for the use of an LED light string to light the Putz. 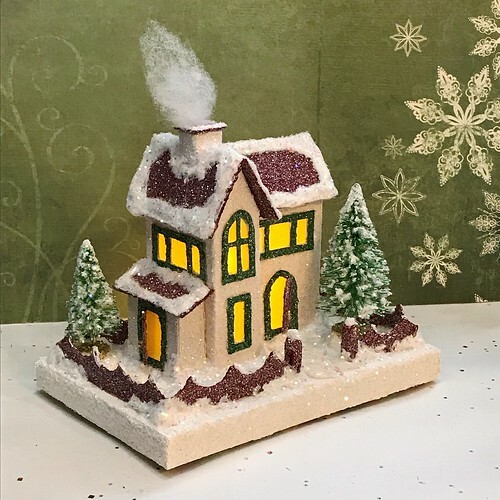 A puff of smoke is included with the Putz houses that have chimneys. 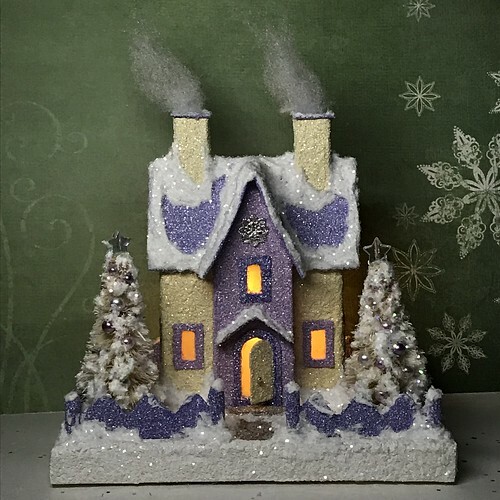 Smoke is optional, so it is just tucked into the chimney. Removable if it isn’t wanted. 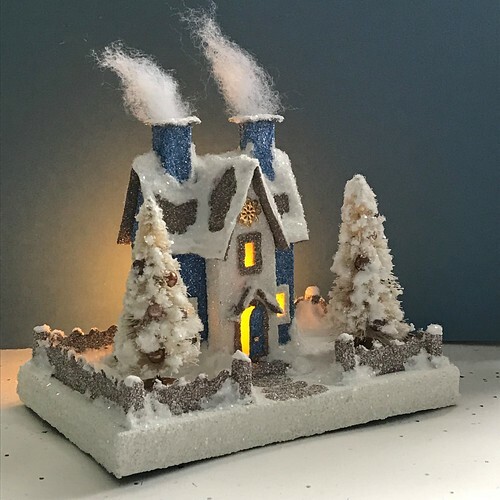 The polyester fluff I use for the smoke stands up well, so it doesn’t need to be glued or supported in any way. A pair of tweezers or other pointy object works well for tucking the smoke into the hole on the top of the chimney. I plan to keep this house for my own collection. It appeals to me on many levels. A mini Putz. Springtime Lily of the Valley. Beautiful colors. It’s a keeper. 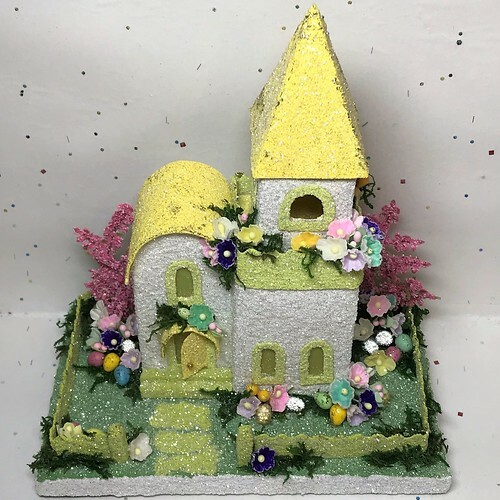 I have listed two Easter Putz churches to my Etsy shop. 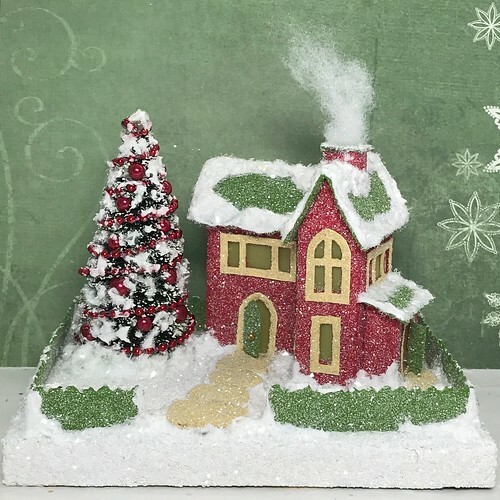 They were a refreshing change from making snowy, winter Putz houses. 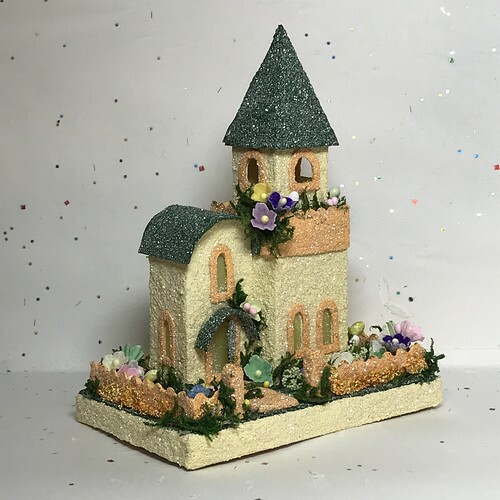 The first one is a miniature version of the church. I copied the pattern at 80% of the original size. It’s always fun to see the Putz with the lights on. It brings out their personality, adding some life to the scene. 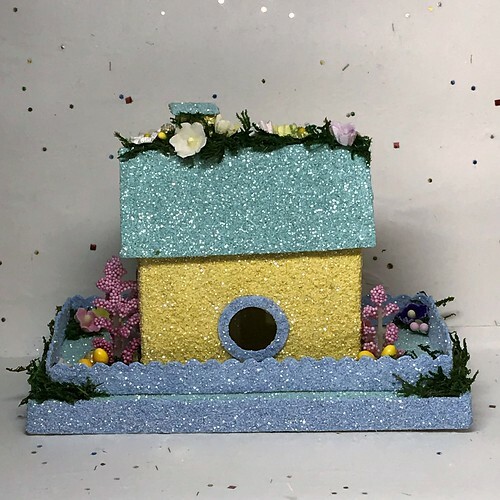 The base is made from an upcycled Easter greeting card. The mulberry paper flowers pop against the dark green of the preserved sheet moss. 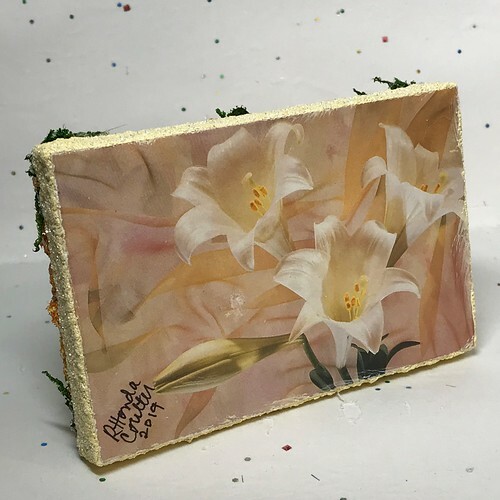 Hand-crafted Easter eggs nestle among the flowers. 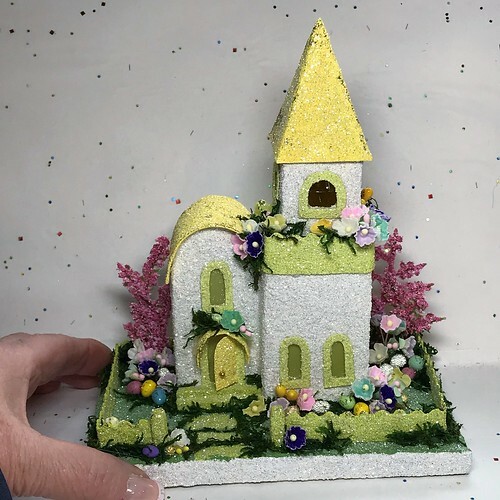 The second Easter church is made in the original pattern size. 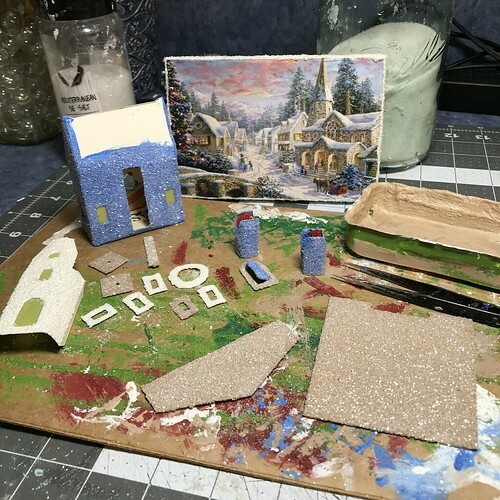 The colors for the Putz church are taken from the colors on the card. 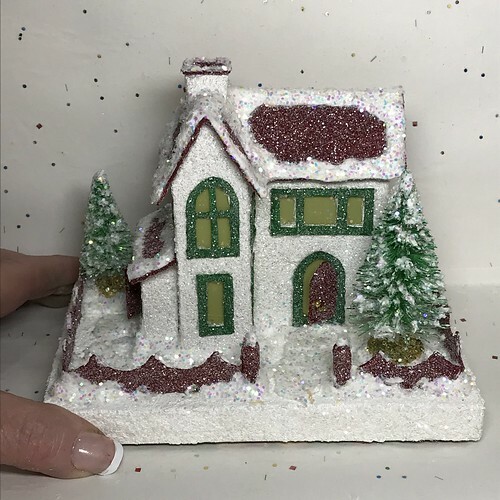 You can see my Putz houses and other Christmas ornaments in my Etsy shop. I am always happy to answer questions about the process. Please ask, if you are wondering about the details of putzing! All proceeds from my Etsy shop benefit Kenya Mercy Ministries. 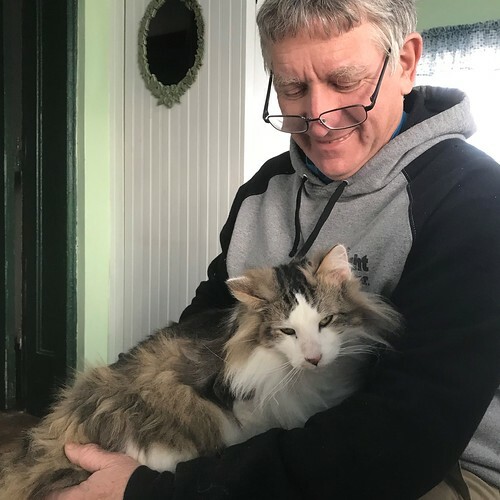 They work with the urban poor of Nairobi, Kenya, particularly the children and their families who live in Kibera, the largest slum in Africa. Thank you for your part in helping these children when you purchase items from my shop! Another week has flown by. 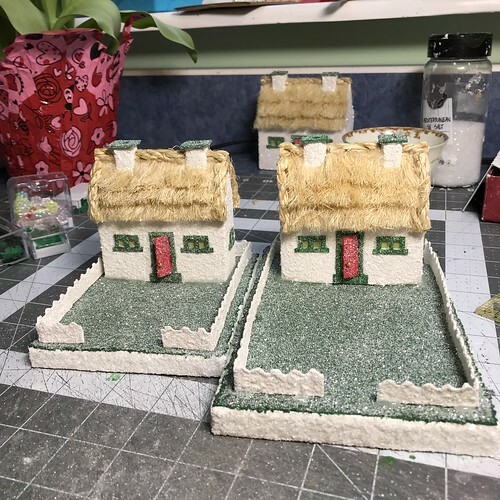 I managed to finish a couple of Irish cottage Putz to list to my Etsy shop. 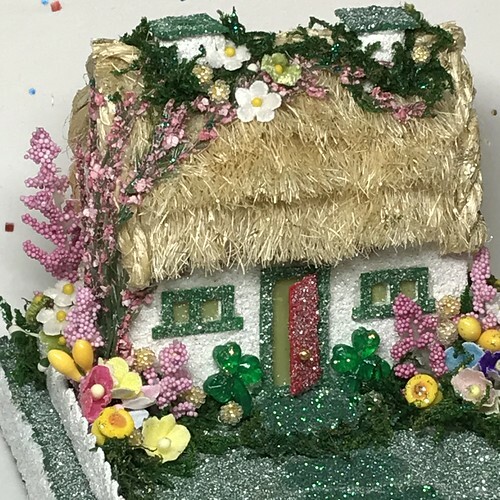 The second cottage included some shamrocks. 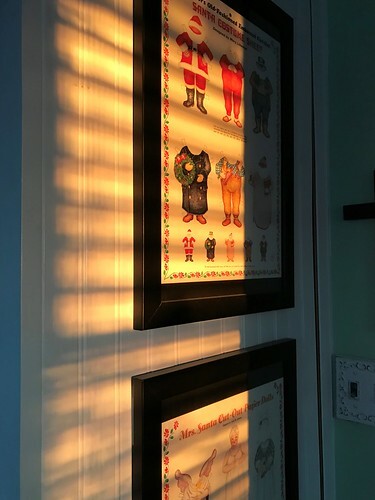 Wednesday morning started with the sunrise shining on my Santa and Mrs. Santa paper doll cutouts that hang on the side of the cabinet in the craft room. 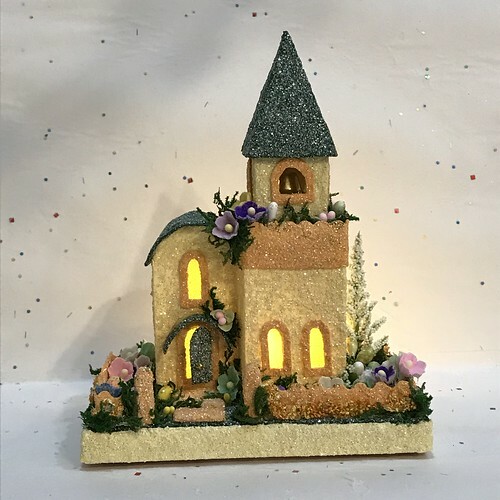 Later that day, I cut out two Putz churches. 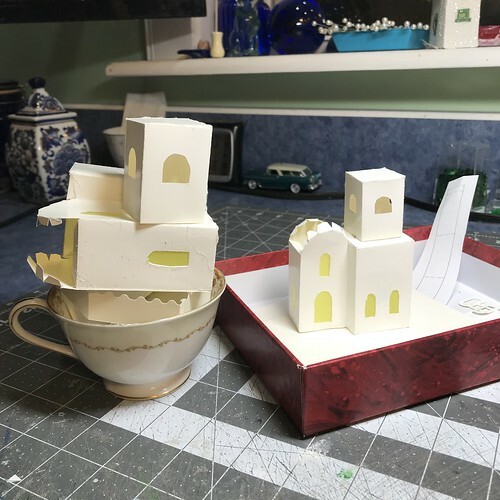 After window panes were added, I glued the pieces together, to the point where they were ready for painting. DH and I drove to the nearest sushi establishment (25 miles away) later that day and bought sushi for Valentine’s Day. While outside we got a picture that proves spring is coming. 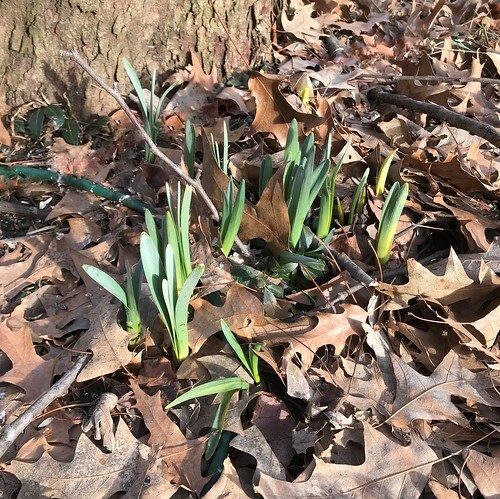 The daffodils are up about four inches. 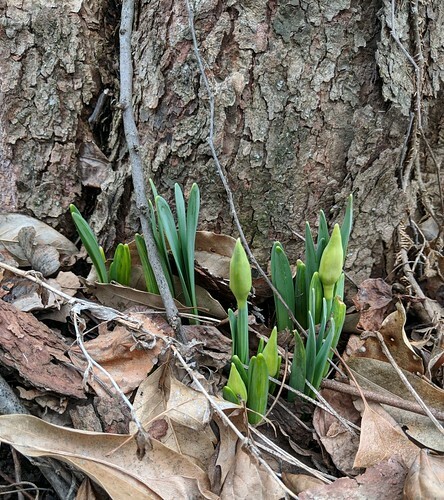 We’ve had tulips and daffs blooming by now in previous years, but it is still early. We’ll wait. 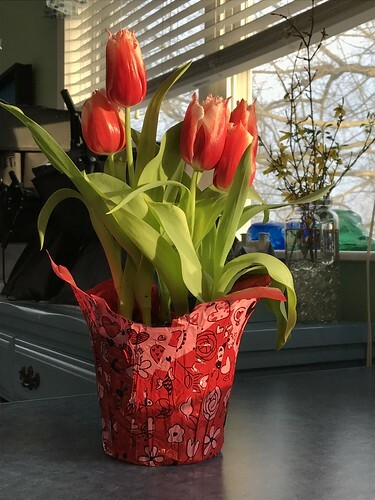 My Valentine tulips brightened my Valentine’s Day. As did Clark and Winston. 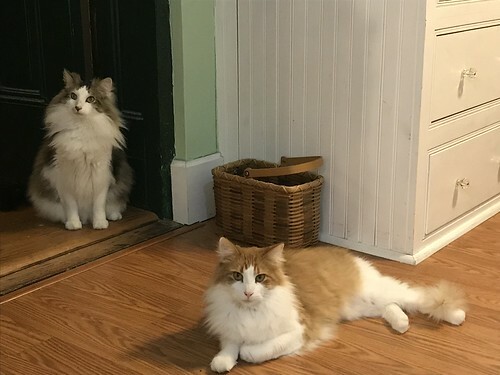 Brothers and good buddies, they love to be where their people are. 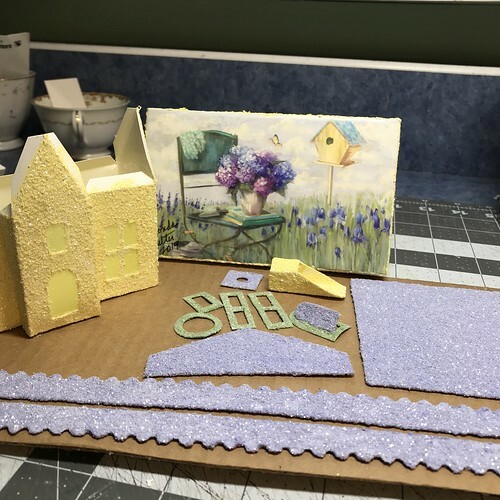 In the craft room. On Thursday afternoon, a friend came over for a crafting session. 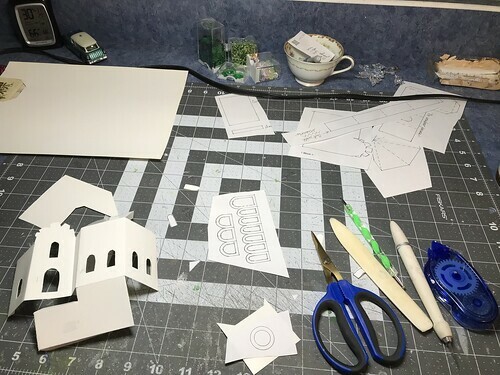 She worked on making cards, while I cut more Putz house patterns. 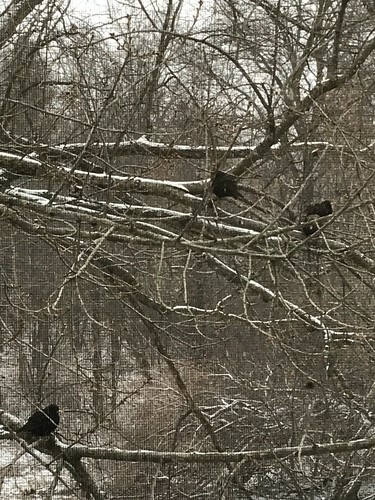 There are three starlings that sit on the same branch outside the craft room window every day. I call them the three amigos…or should that be the “tree” amigos? I’ve been watching them for five or six weeks. Can birds have buddies? Favorite friends to hang out with? Saturday brought sunshine. The shadow from the pins on the windowsill caught my eye. 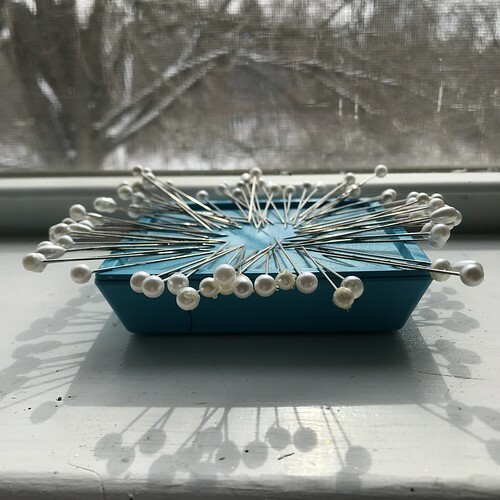 I love this magnetic pin holder, by the way. 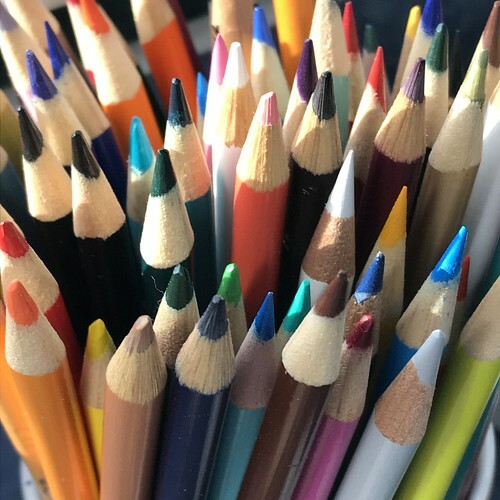 The pencils caught my eye, too. So colorful! 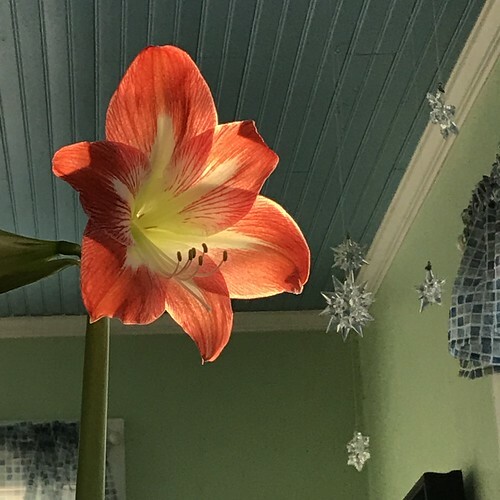 DH sent me a picture from the garden that made me happy. Can’t argue with that! 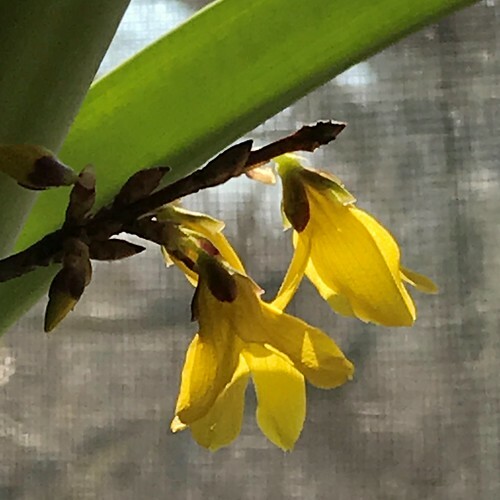 And indoors, the forsythia is still blooming cheerfully. 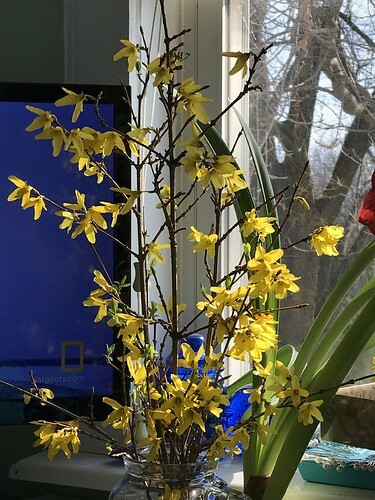 If you have access to a forsythia bush, pick a few branches and bring them in for a spring preview. 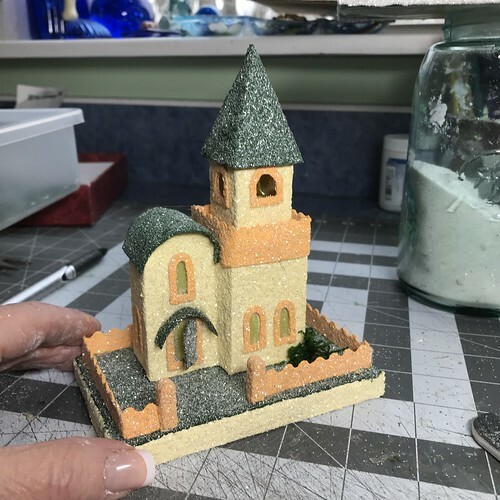 This week, I am finishing the two Putz churches that I cut out this past week. The mini one is done and I’ll finish the larger one today. Stay tuned for a post with pictures of those. 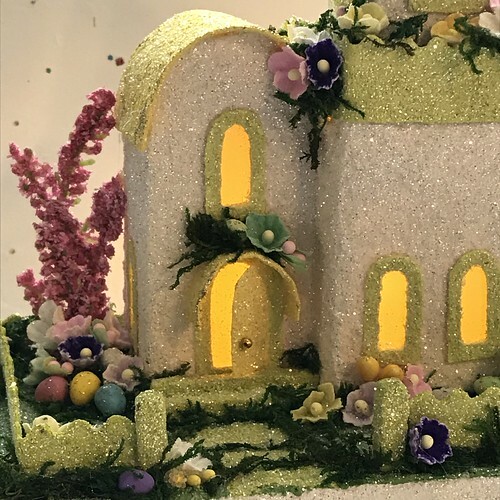 They are done with an Easter theme, which is fresh and springtime-y. 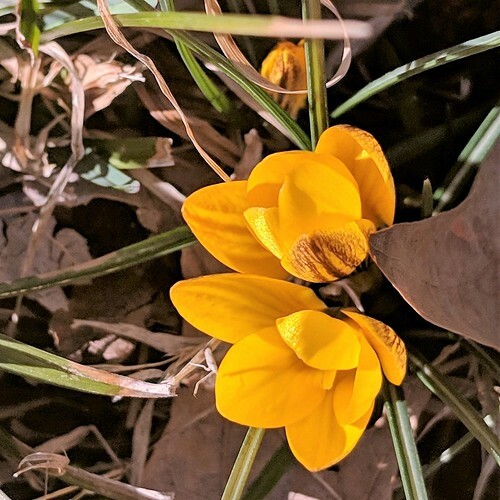 I hope you are seeing signs of spring in your world! 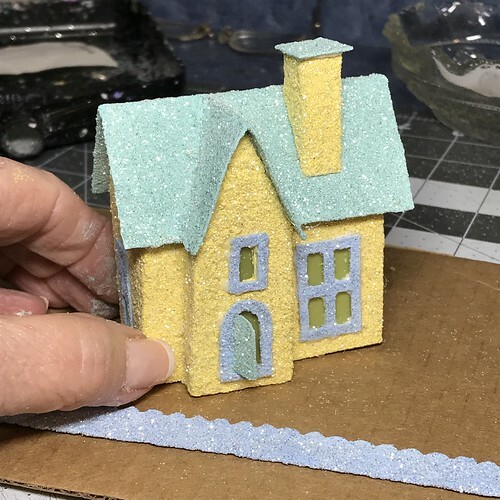 I am currently working on four little glitter houses, all of them Irish cottages. I drew this pattern in March of 2017. 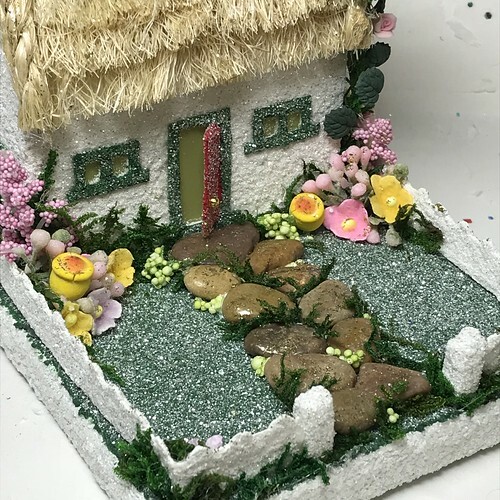 Here’s the mini version of this sweet, little cottage. I made four regular-size ones and two minis. The mini ones are copied at 80% of the original size of the pattern. 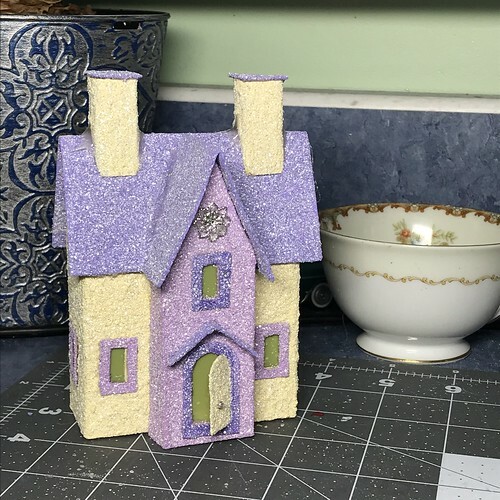 I am going to redraw the pattern, because I realized I didn’t draw the window frames or the door when I made the pattern initially. Not sure how I neglected to add them to the pattern. I may make the windows a little bigger, too. What do you think? 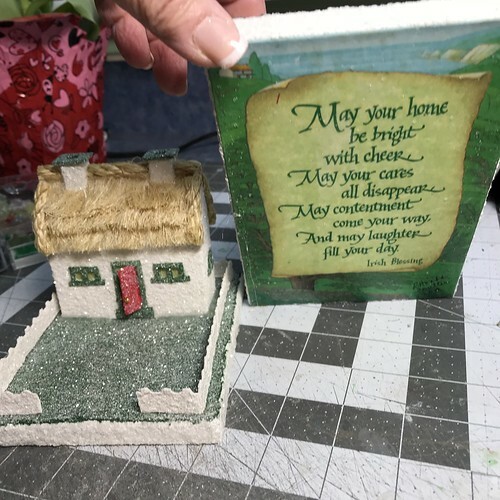 I went through my stash of greeting cards and found these two cards that work for an Irish cottage base. The larger one is actually a piece of vellum. I mod-podged it to poster board before making the box to give it strength and structure. 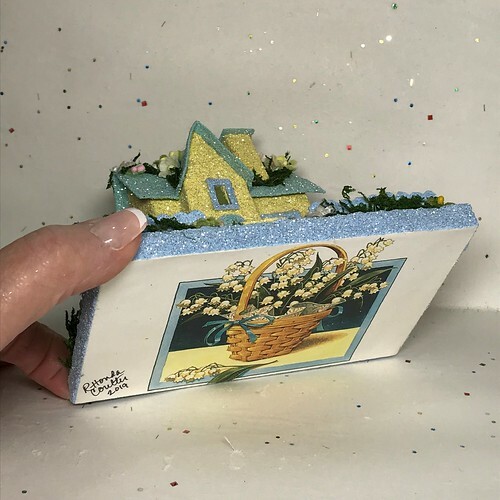 My tutorial for making Putz bases from greeting cards is here. 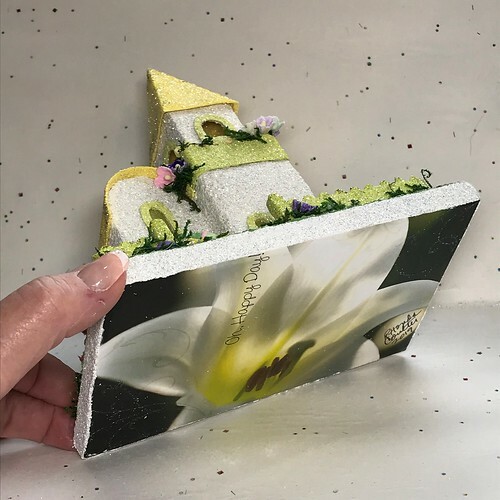 Bases from greeting cards. 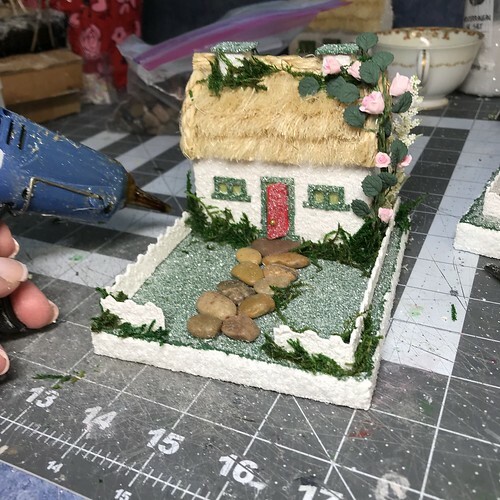 Once the bases are made and the houses are painted, it’s time to glue things together. I add the window and door frames. 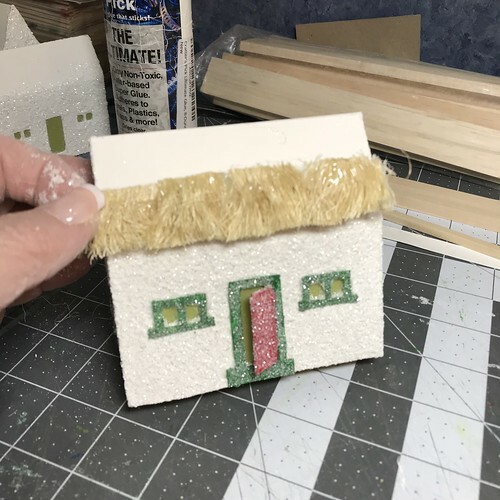 In the case of the Irish cottages, I don’t glue down an additional roof as I will be adding thatching to the roof. 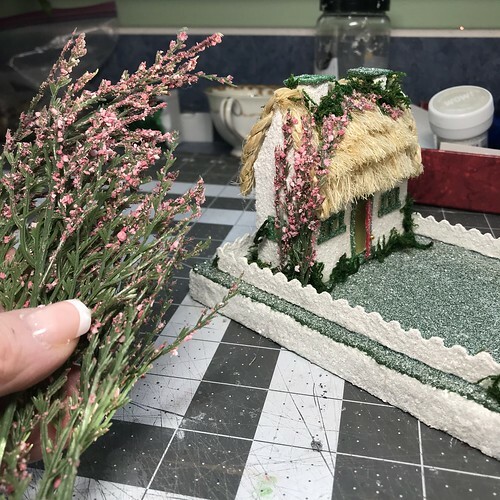 I love to add the thatching. It makes such a big change in the look of the cottage. 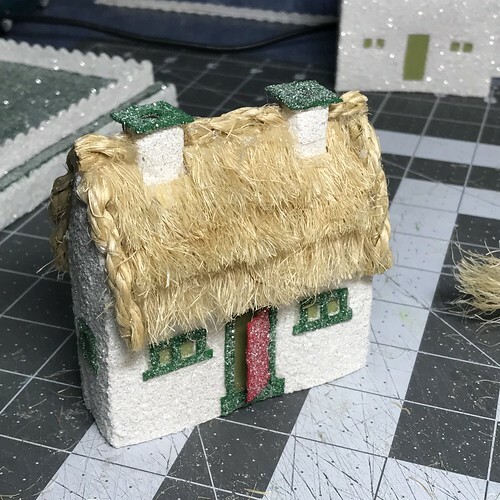 I plan to write a tutorial about my method for making thatching and will link it here when I have it posted. How totally cute is this?! The next step is to add the fence to the base. Always check before gluing anything to the base. Is it oriented in the right direction? When you tilt the Putz up from the front, the card should be placed so you can view it correctly. 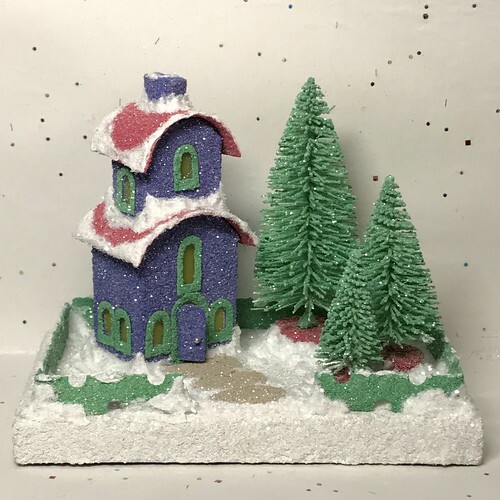 When I am making a Putz that will not include snow, I do a bit more (sometimes, a lot more!) landscaping than I do for a Christmas Putz house. I have a good collection of artificial foliage. 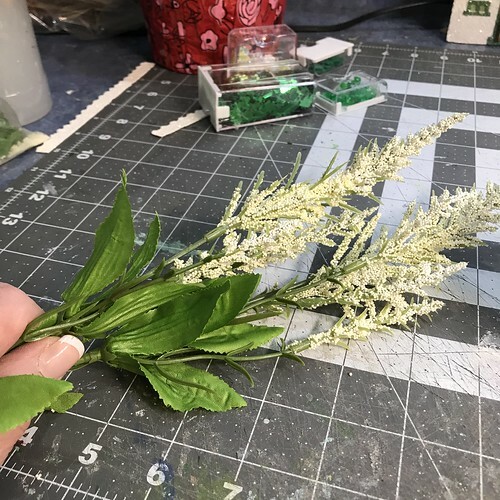 I look for foliage, flowers, berries, etc., that can be cut into smaller pieces. This is artificial heather. Little stems cut from it make a lovely flowering vine for the cottage. Pieces like this can be cut to size as small trees. I have even cut the tiny individual sprigs off the stems and used them as itty-bitty hyacinths in a spring garden. I use preserved sheet moss for the “grass” around the fence and the flower beds. I cut the vining rose in half so I will be able to use it on two cottages. 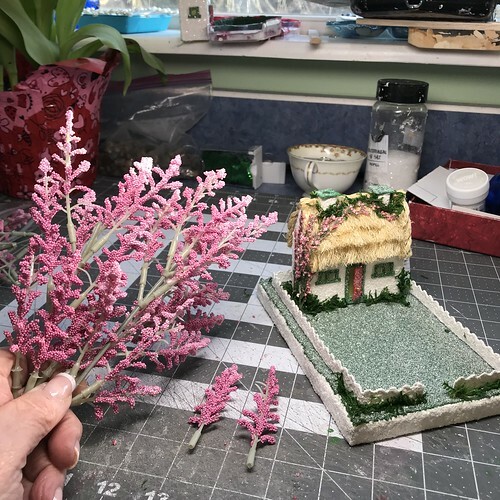 I don’t know where I purchased the one I have, but by googling < miniature rose vine >, I found it is available on dollhouseminiatures.com. Aquarium stones were used to make the front walk. When first put down, they seemed too large, but after I added moss and tiny bits of “flowers,” they looked just right. 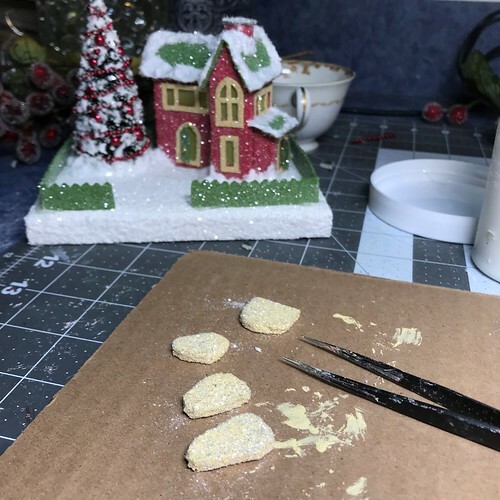 When the walkway was done, I used some gold glitter-glue to wash a little shine over the individual stones. 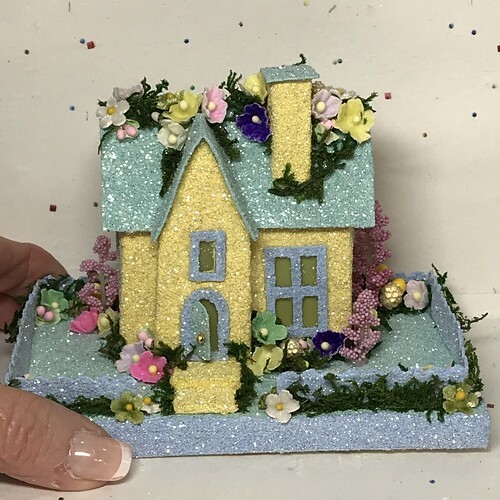 I plan to do some Easter and spring houses, so I will be able to use the tiny mulberry paper flowers again. This week seemed to fly by. So much to do. So little time. I am in the process of tailoring a planner to fit my own needs. It makes me aware of how much I want to do and how much more time I would need to do it all! But it IS helping me schedule my days to better manage the time I’m given. 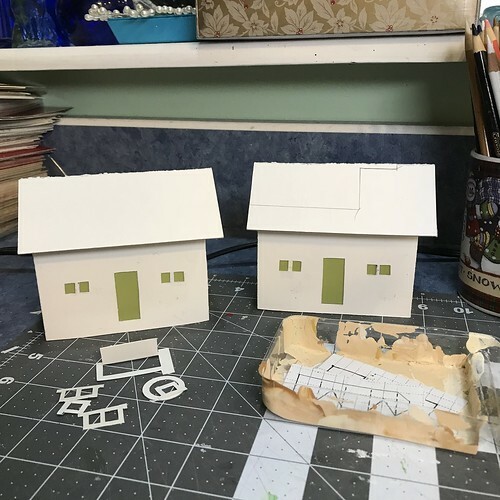 This week’s first picture is of two Putz houses I finished last week. Same pattern, different sizes. The smaller one is reduced to 80% the size of the larger one. Easy to do, using a printer to change the size of the pattern. February 4 is my best friend’s birthday. 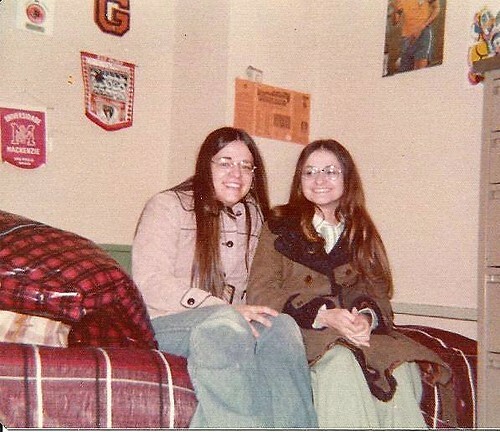 We were college roommates and remain best friends 40+ years later. Me on the left. MJ on the right. In her boyfriend’s room. Now her husband. 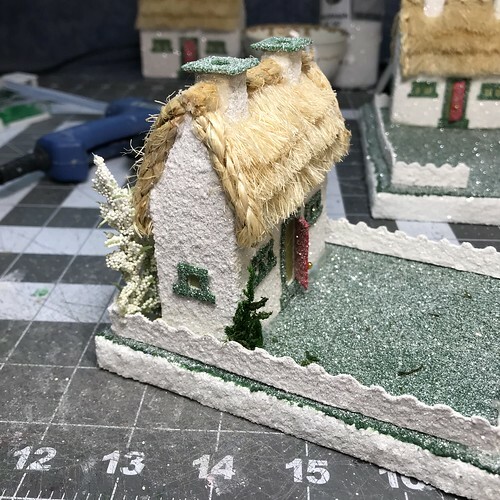 I am working on Irish cottage Putz houses this week. On Tuesday, I cut them out and assembled them. 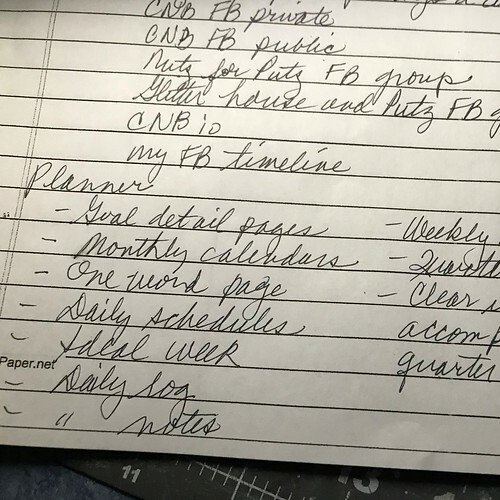 As I mentioned, I am working on a planner that fits my own needs, and on Wednesday, I worked out the kinds of pages and categories I want in my planner. 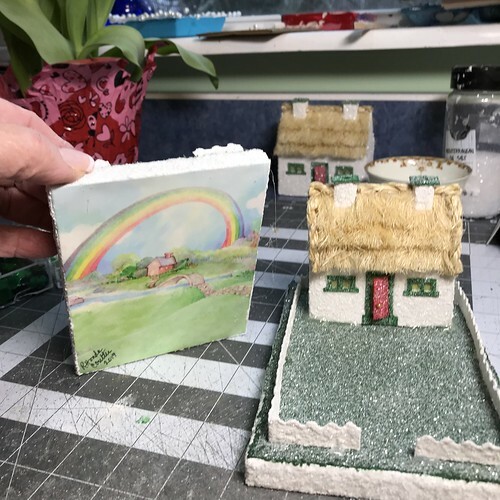 Thursday, I began painting the Putz and I found two greeting cards I could use for the bases of two of the Irish cottages. I also ordered some vintage St. Patrick’s Day postcards from Etsy to use for more bases. 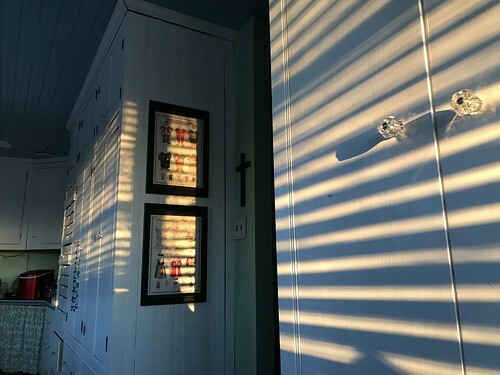 Friday I was up early enough to catch the first rays of sunlight in the craft room. The room has a large east window and two large south windows. 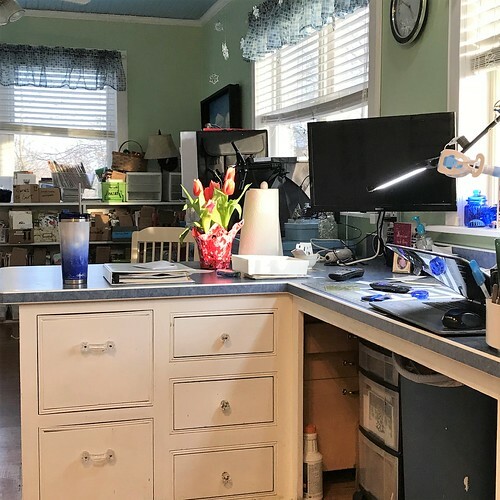 The space between the cabinets is the doorway to the hall. 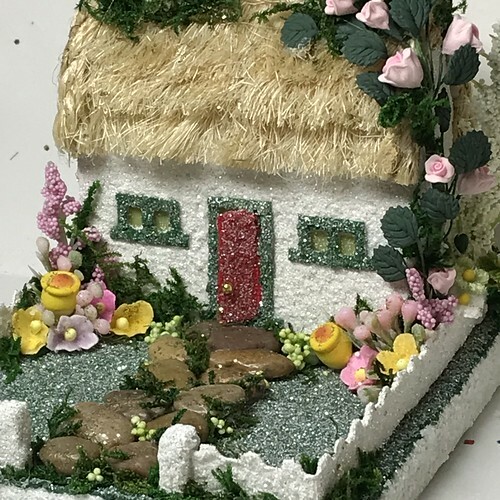 I also made thatching for the Irish cottages. 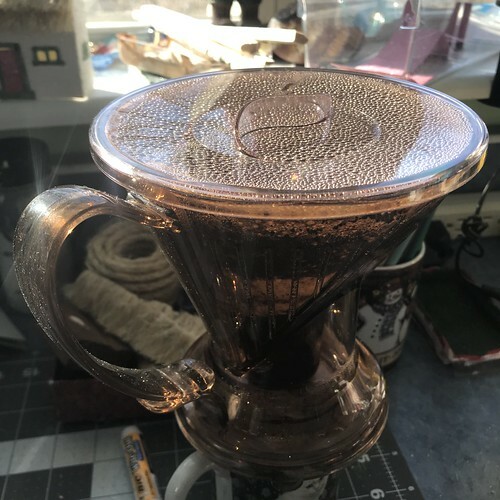 It’s the condensation on the underside of the lid of my Clever Coffee Dripper. I like this little coffee maker. It makes one perfect cup of coffee for me each morning. I’m not a coffee drinker in the summer months, as a general rule, but in the winter, I’ve come to appreciate it. 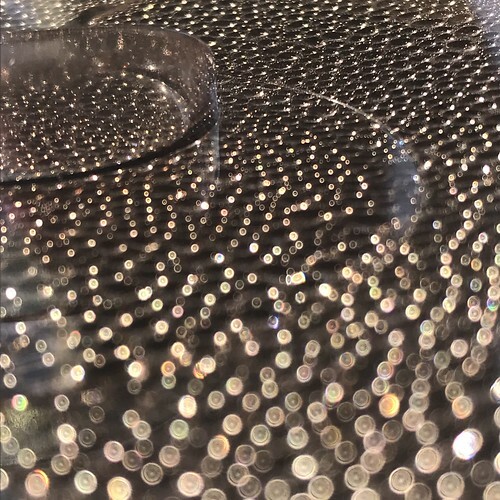 The sunlight hit it just right and it made a striking pattern. Bokeh, bokeh, bokeh! 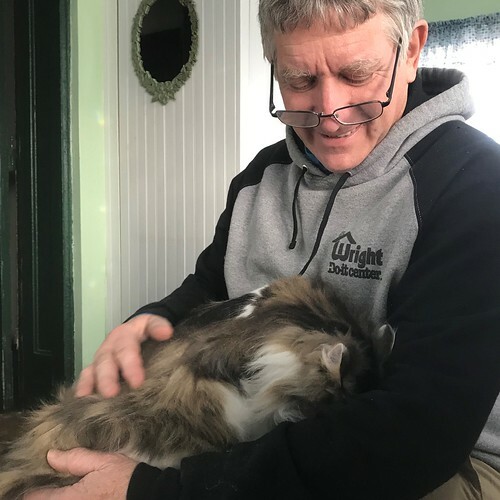 When Clark the cat gets a pet, he likes to tuck his head under your arm. I called his name and he popped up just long enough for me to snap this picture. 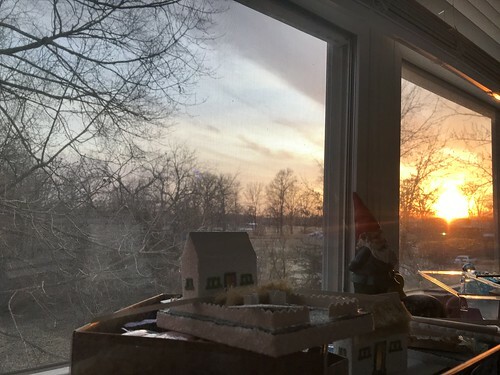 The sunset was pretty Saturday evening. I am glad the days are getting longer again. That does a lot for my sense of well-being. And then, there’s today. Cold, cloudy, grey, and icy. 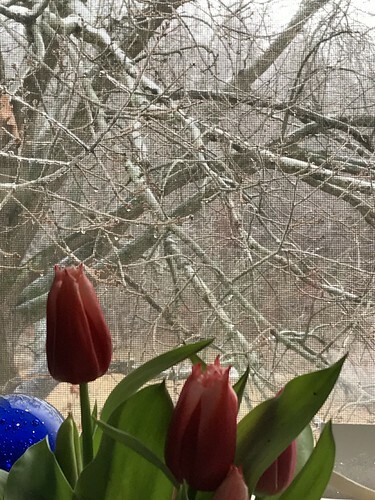 But the tulips give me hope. Last week was quiet, but busy. Now to get ready for the coming week. Here’s a little summary of last week. Bits and bobs. 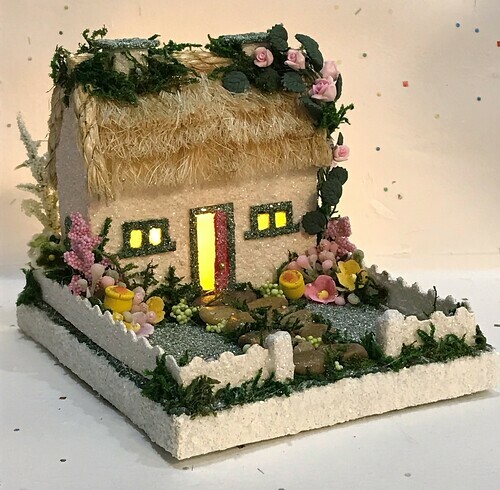 I made four putz houses, including this white one. I’ve enjoyed the forsythia we forced. 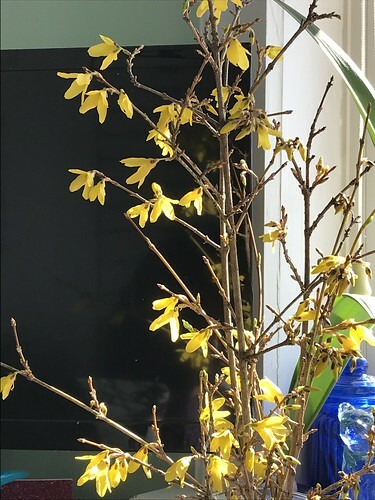 In late January every year, we cut some forsythia branches and force them for an early preview of spring. It’s so easy to do! 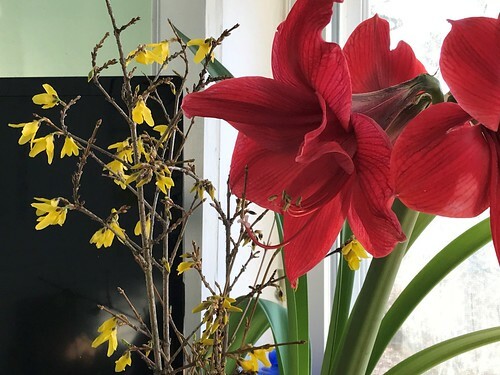 Cut some branches, put them in a vase of water, wait 11-14 days…spring flowers! Give it a try! 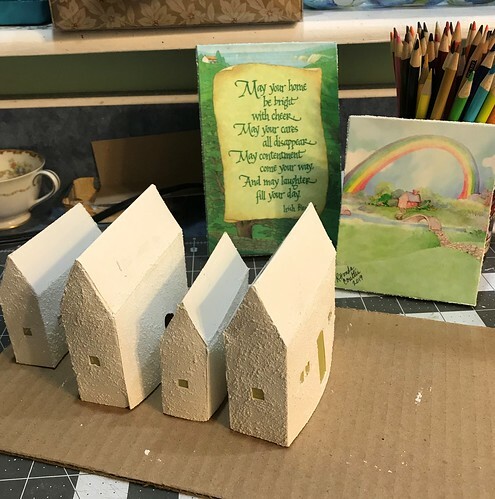 I painted stepping stones for a Putz house. 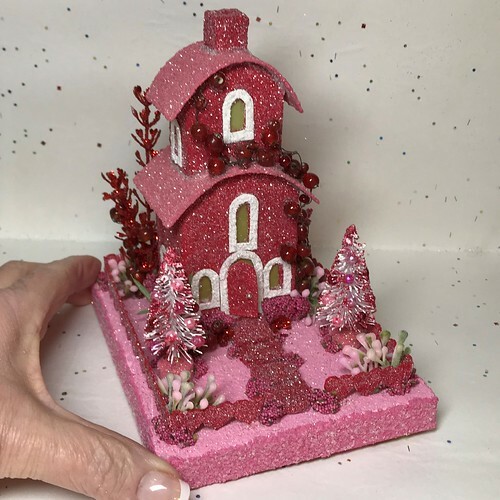 This red Putz is a mini version of the same pattern I used for the white Putz house above. I reduced the pattern to 80% of the original and, in this case, reversed it by folding it backwards. Same pattern, two sizes. I really like the look of the mini ones. 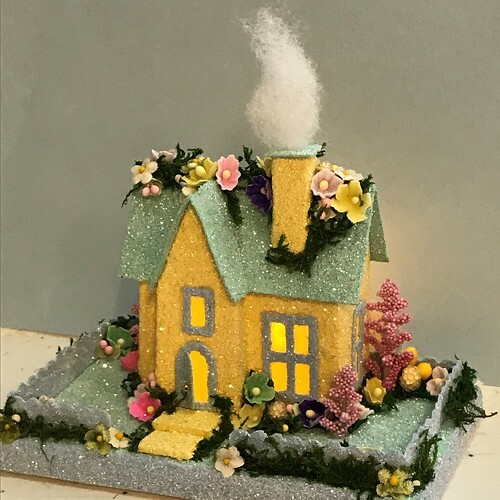 These little Putz houses come alive with a puff of smoke and the glow of lights through the yellow window panes. 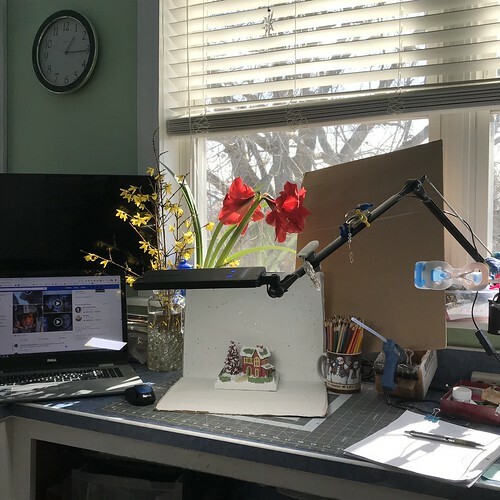 My photo set-up for taking pictures for my Etsy shop. Crude but it works. I do want to set up a photo box for more diffused lighting when taking photos. My desk lamp has four light color settings and a dimmer, and it can be moved and twisted to light any particular angle. Love it! 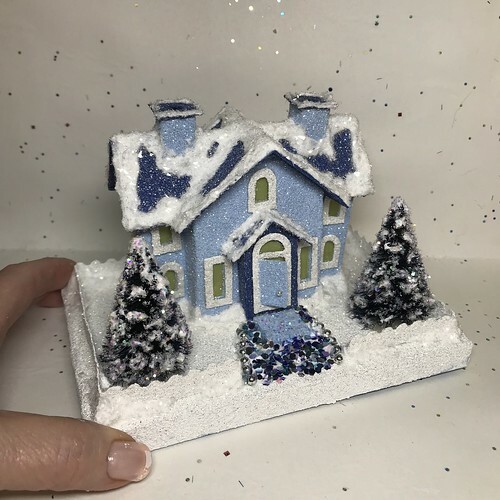 Mini blue and brown Putz house. 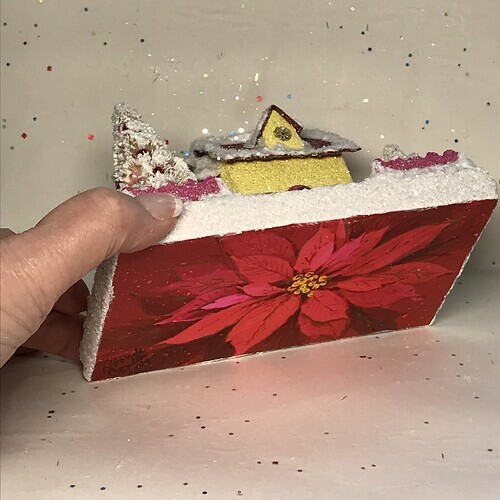 The colors for the Putz house came from the colors on the upcycled Christmas card used to make the base for the house. The painted strips that are wavey on one side will be the fence in the finished Putz house. We had a light dusting of snow Wednesday night. 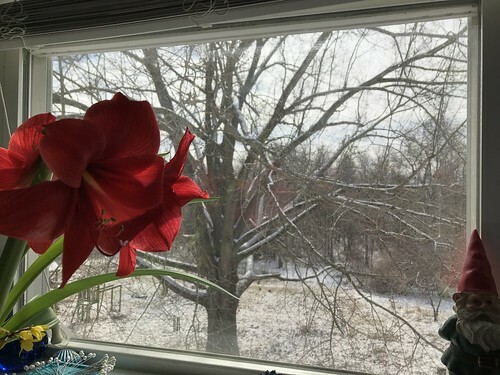 Snow out the window just makes the beautiful amaryllis and the happy yellow forsythia all the more enjoyable. 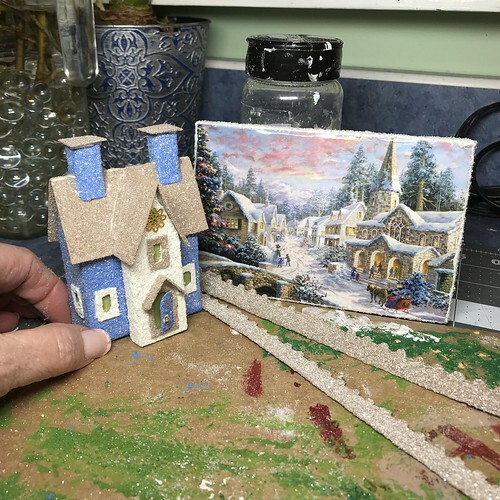 The completed blue and brown miniature Putz house. 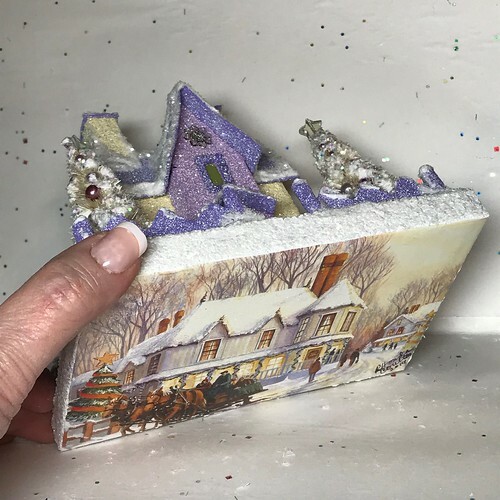 Ivory and lavender Putz house…this house is the same pattern as the above mini one, but made in a larger size. 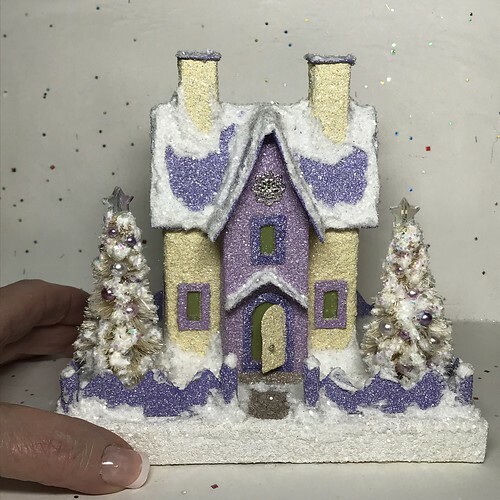 The finished ivory and lavender Putz house, photographed with my hand for an idea of scale. 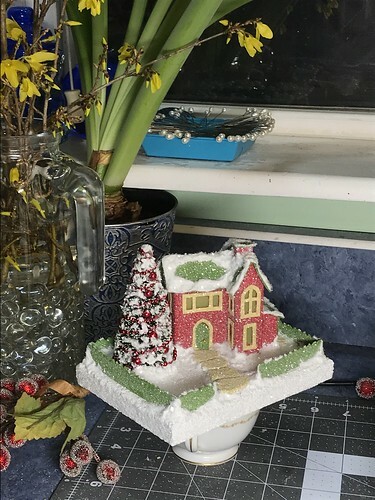 The base is made from an upcycled Christmas card. 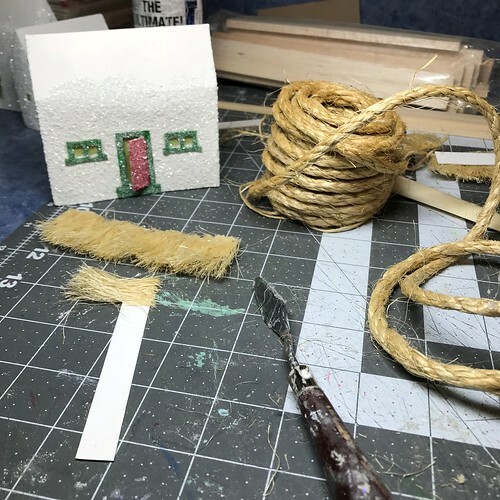 As always, the colors for the Putz house are taken from the colors of the Christmas card. 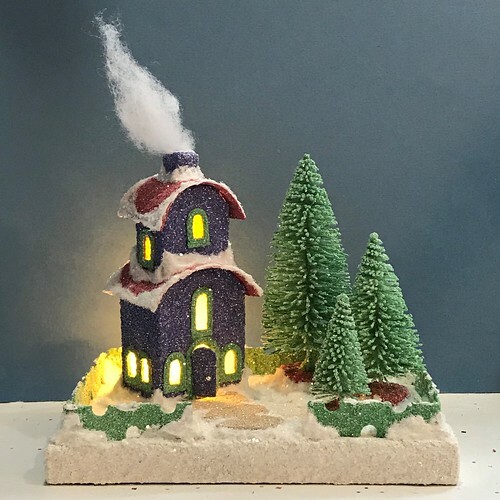 So sweet with the lights on! 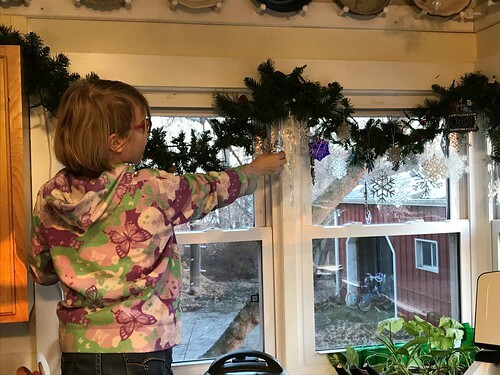 Our grands were here for the weekend and they did the climbing on the kitchen counter to get the snowflakes off the garland. 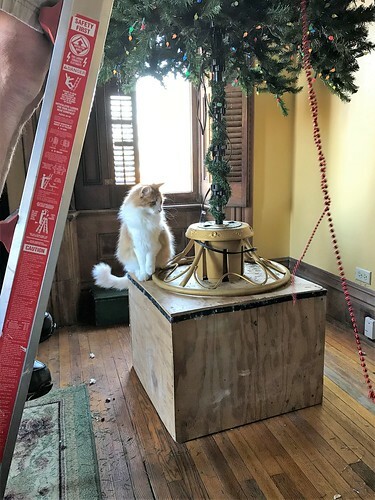 I’ll be glad when all the decorations are down, as much as I do enjoy them. I am ready for spring to arrive! it may be winter outside, but.. 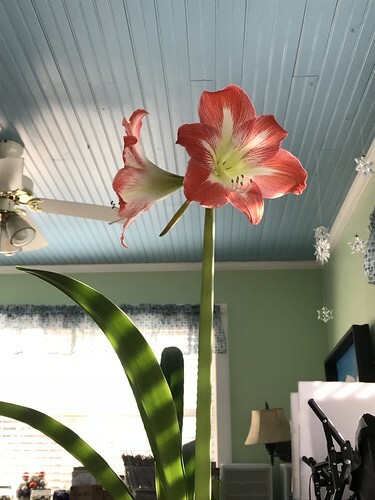 I have a bit of spring inside. 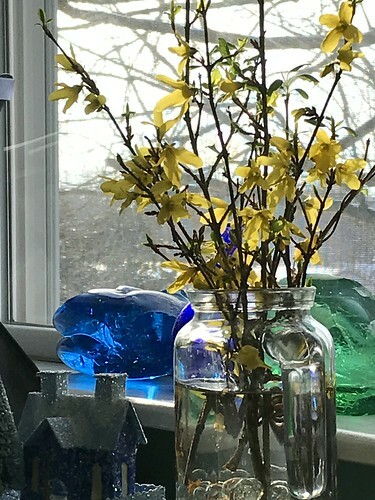 Every year, sometime in late January, we cut forsythia branches to bring into the house to force the bloom. It usually takes 11-14 days for the blossoms to pop out. Forsythia is easy to force. Cut some branches, put them in a vase of water and wait two weeks. That’s all there is to it. You can force other branches, too. Lilacs work, though the flowers stay as buds and don’t open. But the leaves are a beautiful spring green and well worth the wait. Fruit tree branches can also be forced. 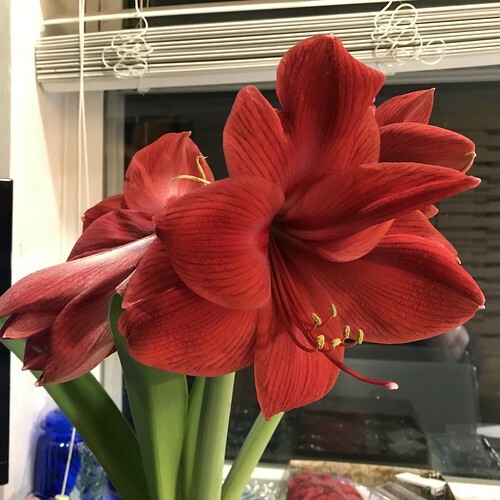 We also have these amaryllis which we planted well before Christmas, but they lagged and lagged, finally sending up their stalks in January. This one sent up one, very long stalk. I love flowers. Especially in January when my spirit wants spring, sunshine, fresh green, and daffodils. These will help me wait a little more patiently. Hello! I’m back! My blog has been down since December 8, due to technical difficulties. Thankfully, my webmaster (AKA my younger son) was able to set things to rights. I can post again! We had a great Christmas and I’ll be posting some pictures from that soon. 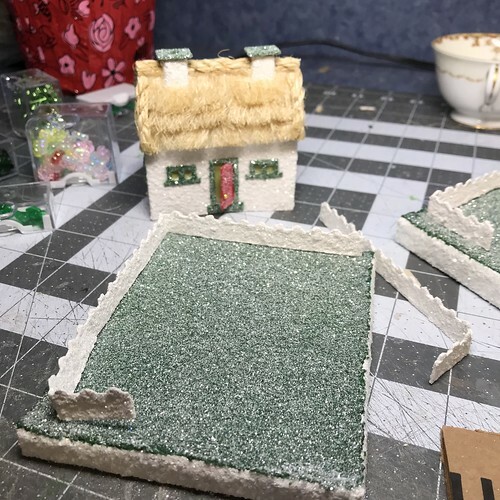 Just to get back into the flow of things, I’ll share some of the Putz houses I’ve been making. This little green one is a miniature. I reduced the size of the pattern to 80% of the original, using the printer to do that. 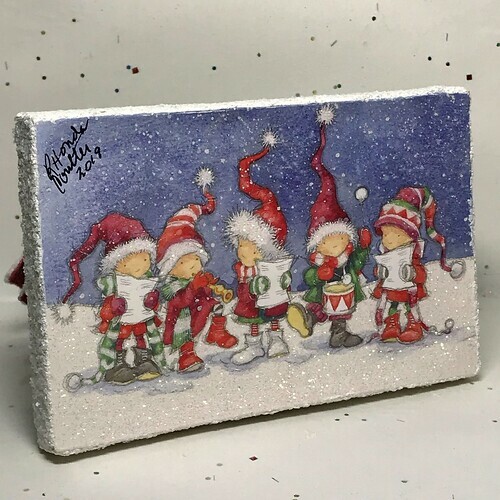 The base is made from an upcycled Christmas card. 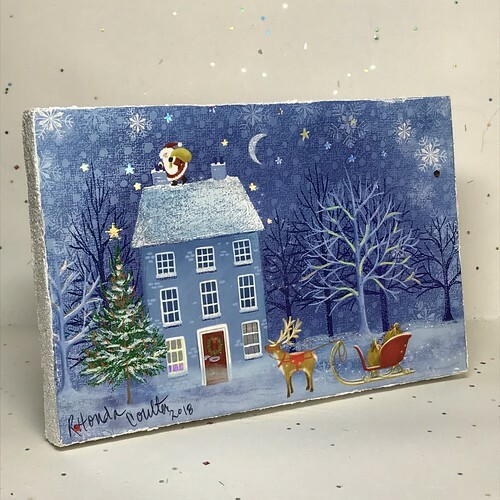 The Christmas card for this base is really cute. I like the tiny Santa and his tiny sleigh. 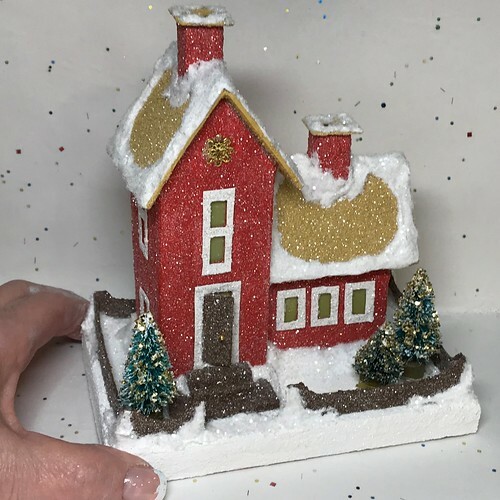 The bright red of this house is a perfect match for the Christmas card on the base. 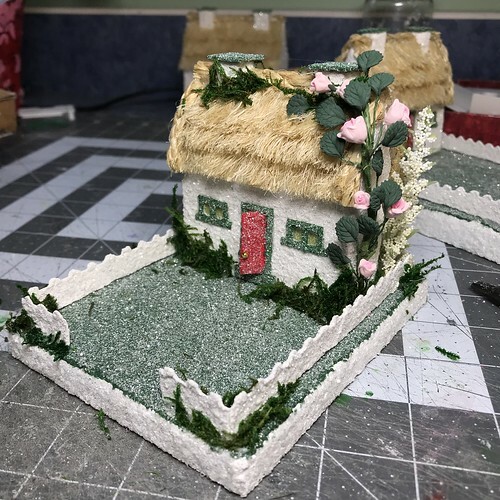 A few weeks ago, I made some Valentine houses. 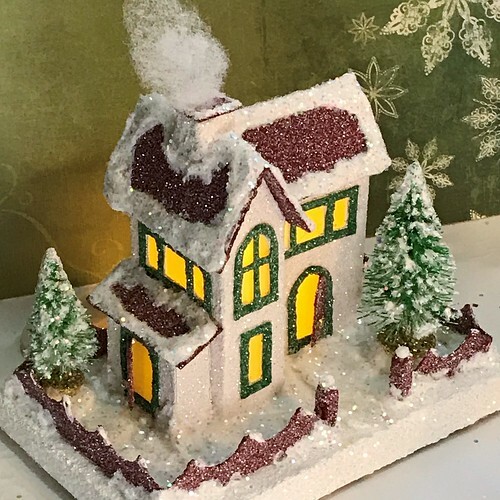 The one below is embellished with some wired glass beads, used as a vine that grows up the right side of the house and onto the second story. 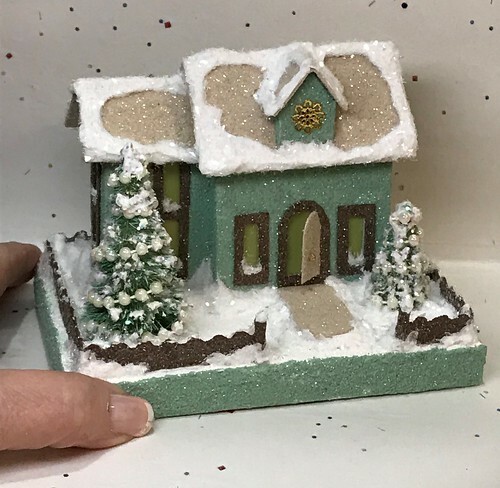 I used the above pattern to make a mini Christmas Putz house. 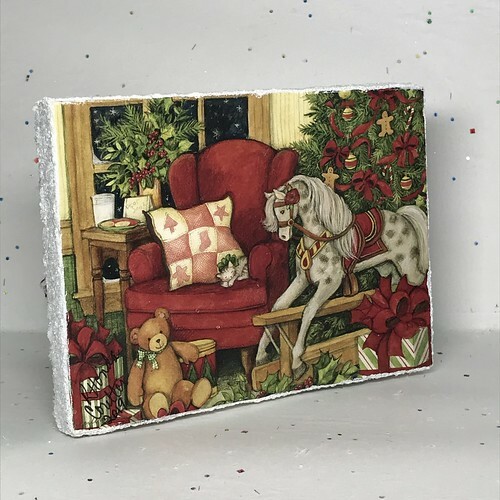 The colors are inspired by the Christmas card I used as the base. 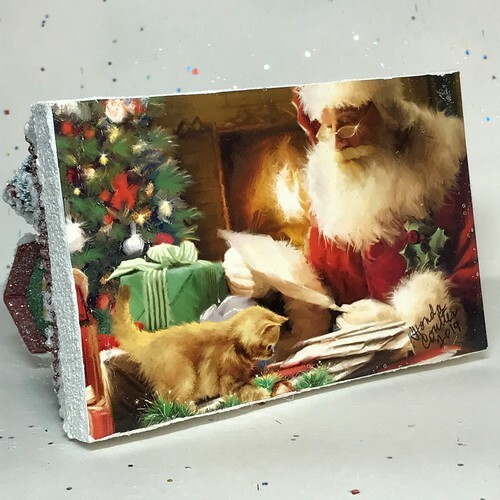 The following Putz has another cute Santa card as the base. 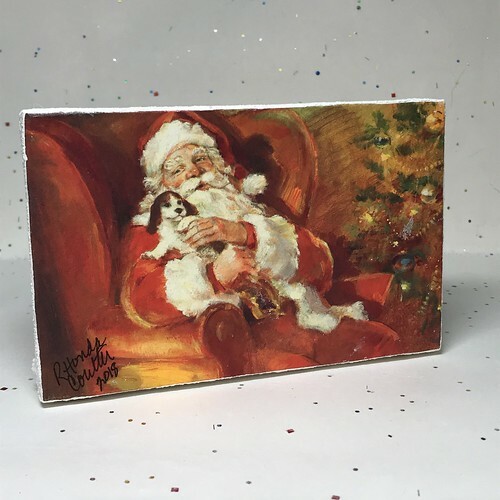 This is one of my favorite cards featuring Santa Claus. 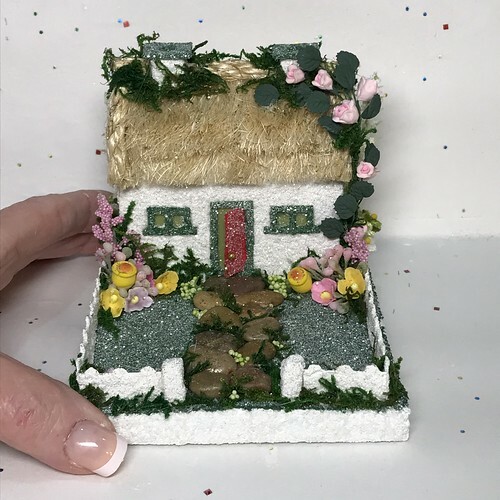 I used the same pattern to make this mini version. 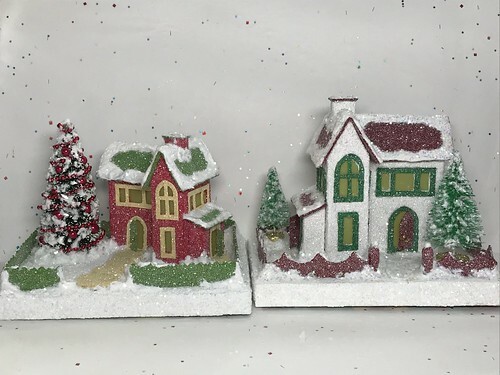 The last two Putz houses are also a regular-sized pattern and a mini version. 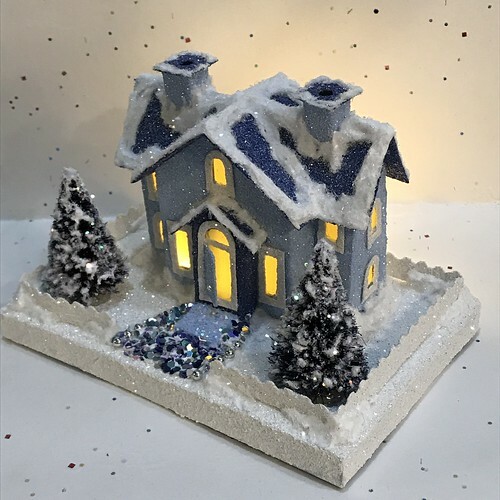 The house looks ivory in the above picture, but it is actually white. This is a better photo. Tilt the house up and you get a very cute surprise! All proceeds from my Etsy shop benefit Kenya Mercy Ministries. KMM works with the urban poor of Nairobi, Kenya, particularly the children and their families who live in Kibera, the largest slum in Africa. Thank you for your part in helping these children when you purchase items from my shop! 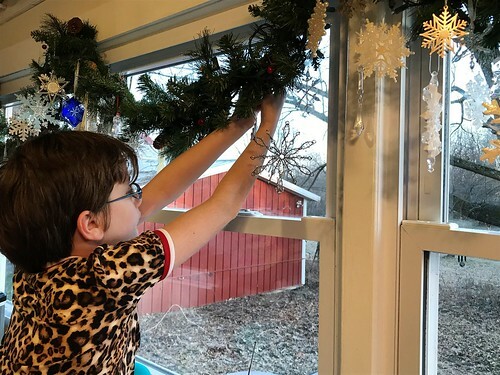 I haven’t taken time to get pictures of all the decorating yet, but here are some that my eleven year-old grands took for me just before the open house started. More about the open house soon! 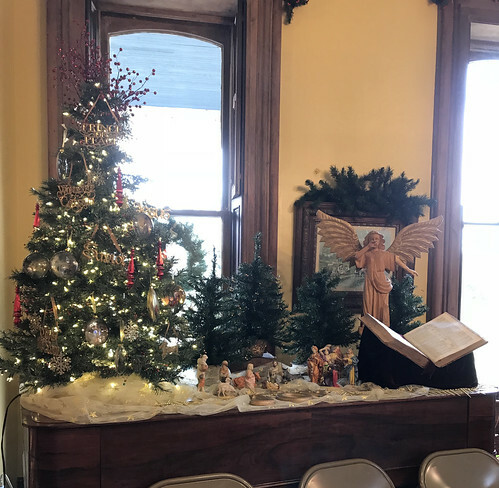 The next tree sits on the old, box grand piano, next to the nativity my Mom gave me in 1983. 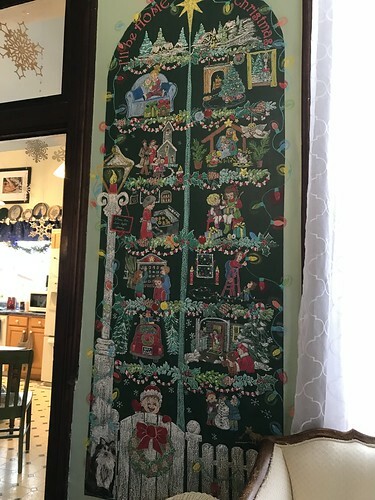 This tree has names of Christ and beautiful nativity ornaments on it. 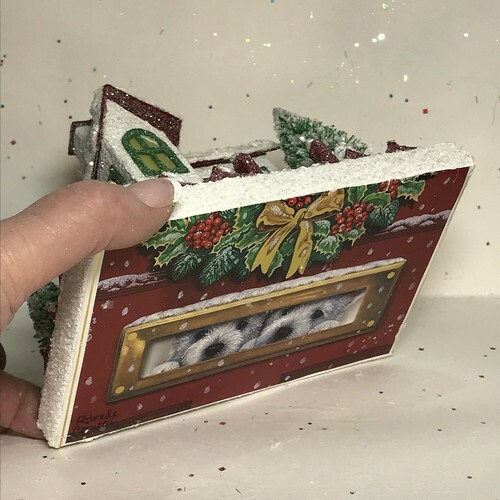 I have a Christmas Notebook group online, where I teach others how to be organized for Christmas. 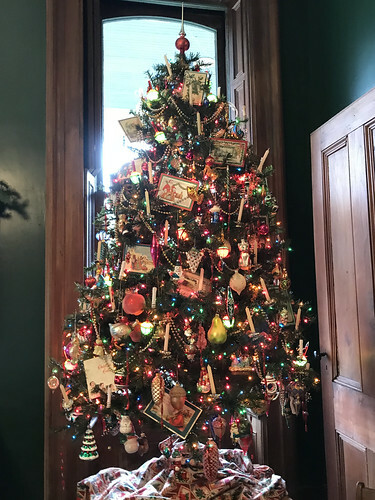 This tree, in the living room, has ornaments I’ve received over the years from members of that group. 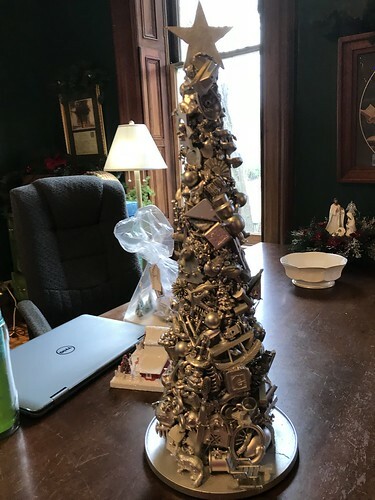 Many of us participate in an ornament exchange every year. Most are from the US, but there are some from Australia, England, and Canada among them. 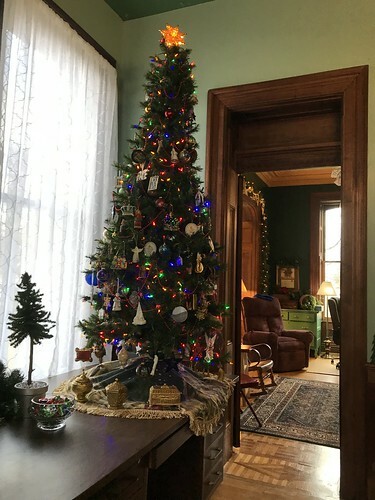 The largest tree in the living room is the Family Tree, where we display the ornaments we have gathered as a family over the years. 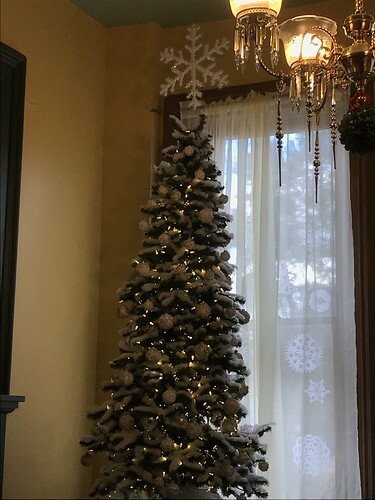 The Snow Tree is in the dining room. It sits on a round, antique table. The ceilings are 12′ tall. 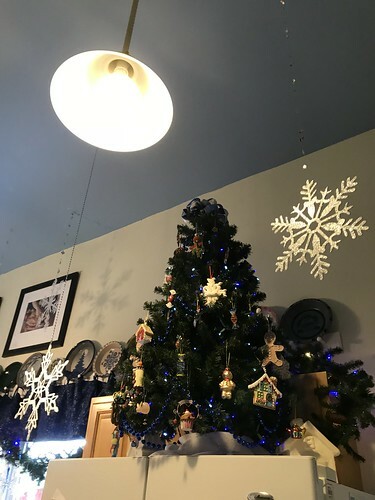 Above the tree, as a tree topper, hangs a large snowflake, hovering just over the tree. 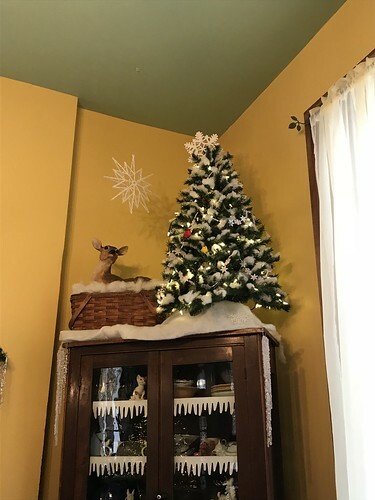 A smaller snow tree sits on top the antique cupboard. 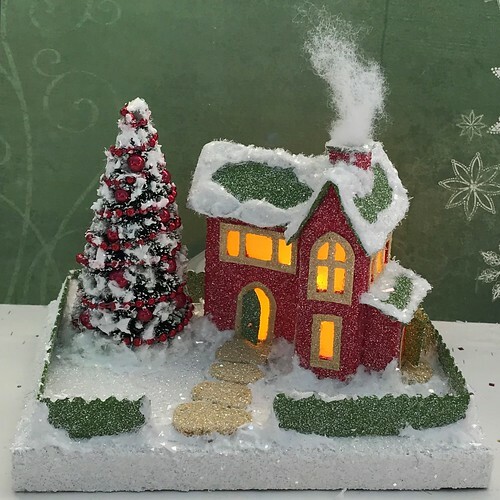 The kitchen tree sits on top the refridgerator and is decorated with cookie and candy ornaments. 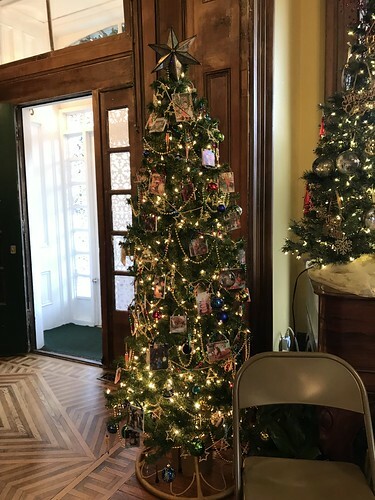 The nativity tree is decorated with nativity ornaments. It sits on a desk in the music room. 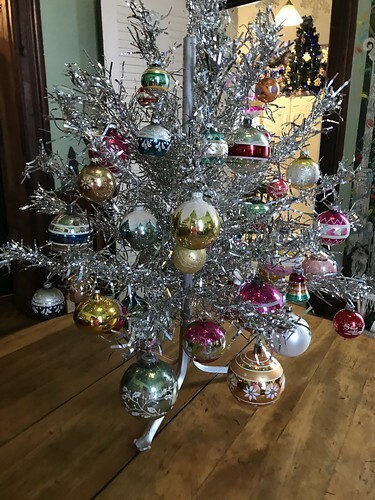 This vintage aluminum tree, decorated with vintage ornaments, sits on a round, antique table in the middle of the music room. 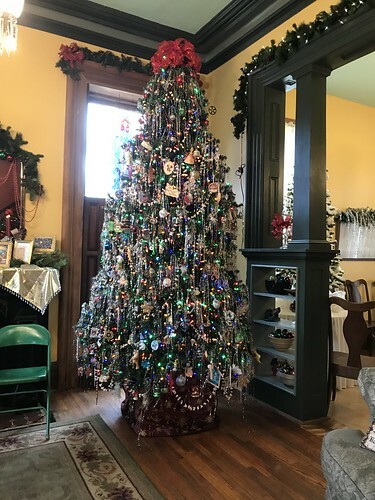 The Glass Tree is in the bay in the library (our family room). 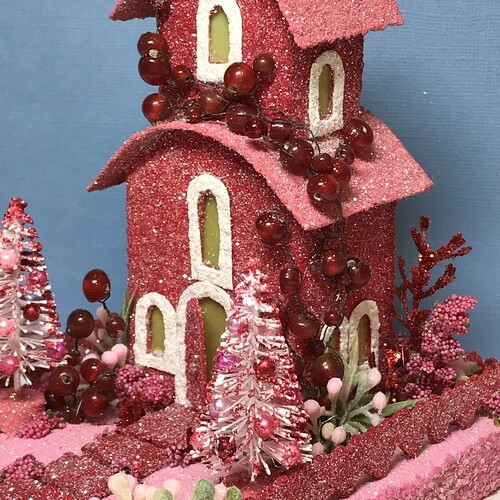 It is entirely decorated with glass ornaments. Mostly clear glass, spun and fused. 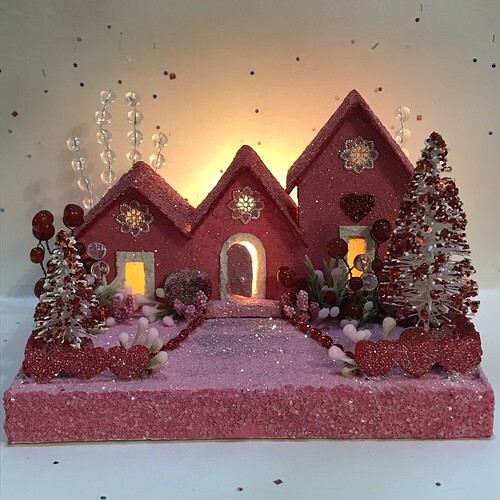 It also has more than 250 chandelier prisms and glass bead chandelier chains as garlands. 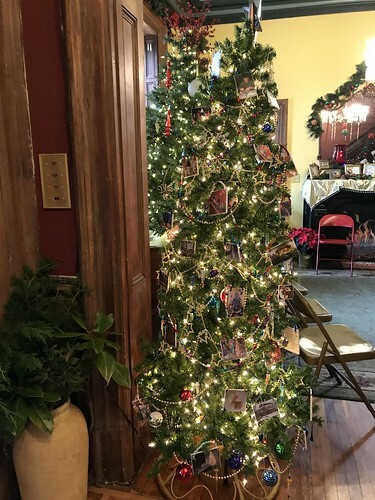 The little “I Spy” tree is a favorite of the children who come to see us during the holidays. 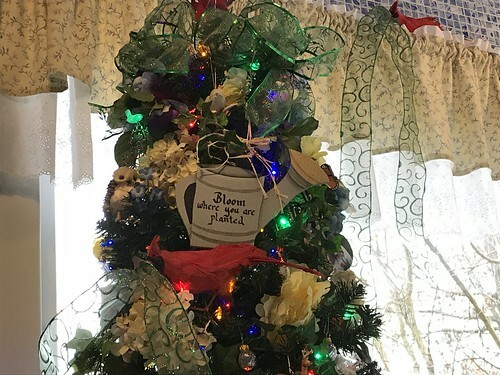 Follow the link to see some close-ups of the fun items on the tree. 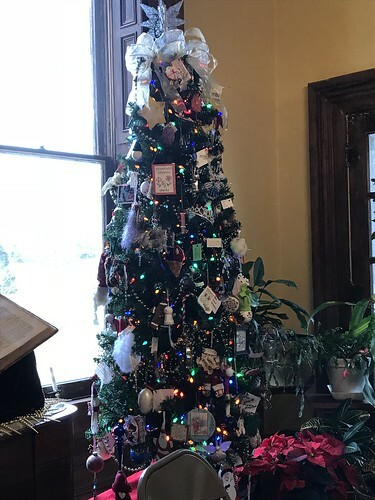 The Bubble Light Tree is also in the library. It sits on a wooden chest in front of the porch window. 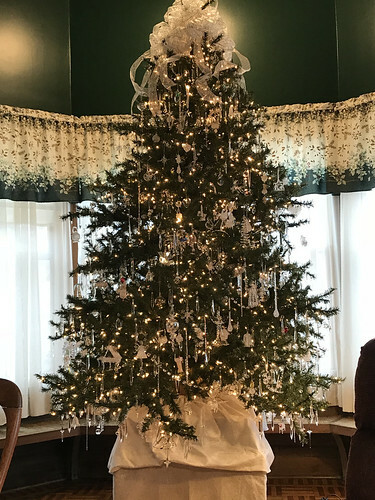 German blown-glass ornaments decorate this tree. 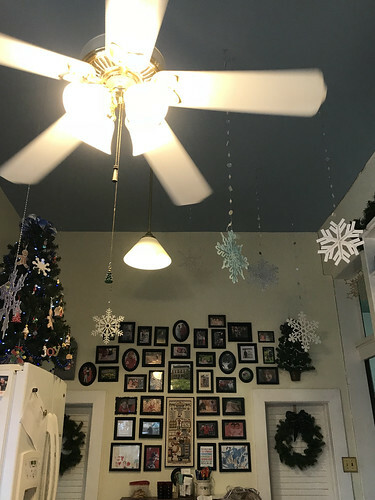 The Mission Tree is in the hall of the addition. 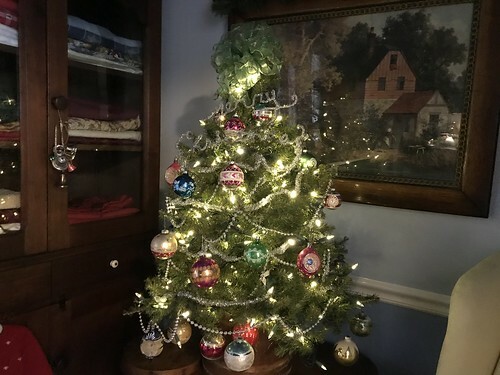 This tree holds ornaments I’ve made for my Etsy shop. All proceeds from my shop support Kenya Mercy Ministries. 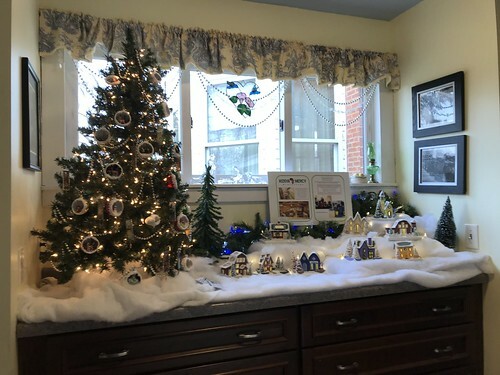 A Putz village is displayed on the counter next to the tree. 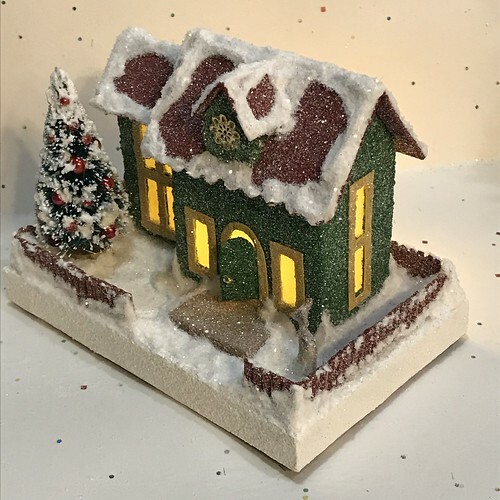 For a donation to KMM, guests could choose an ornament or a Putz house as a thank you gift. 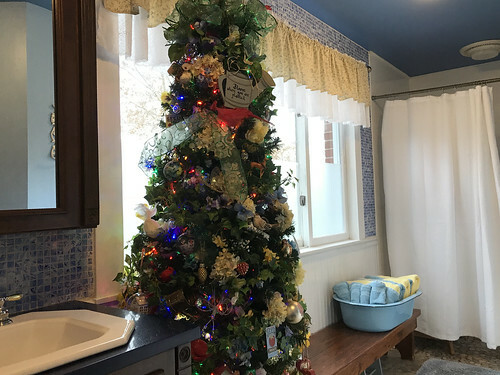 The little tree in the laundry room displays more vintage ornaments. 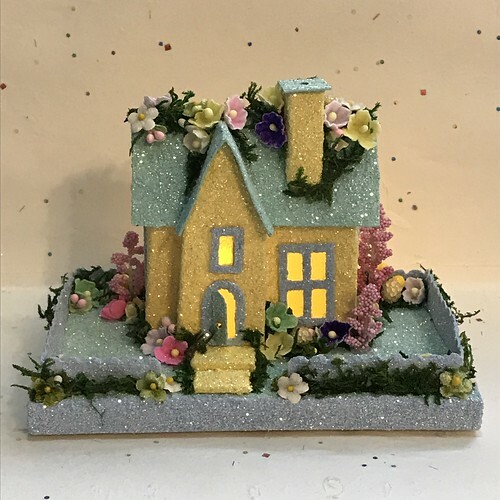 In the downstairs bath, a slender Garden Tree is decorated with garden ornaments…birds, insects, flowers, garden tools, etc. Two cardinals help decorate the tree with green ribbon. 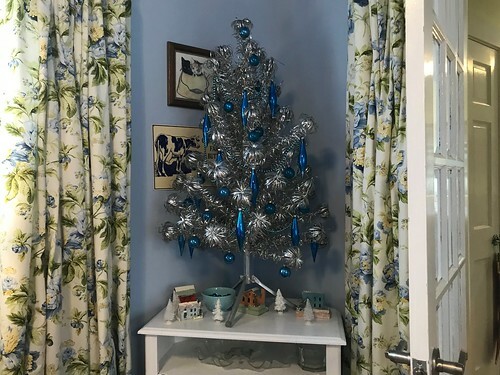 The pompom aluminum tree in the bedroom is decorated with vintage, blue, ornaments and vintage, blue, mercury bead garlands. 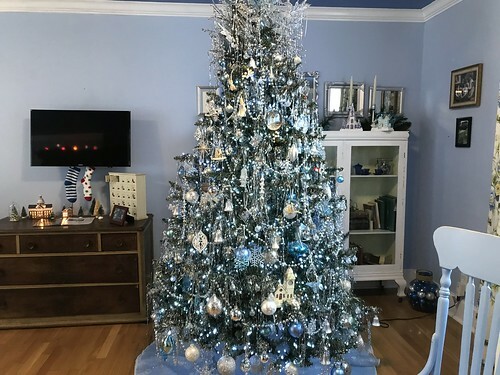 The Blue and Silver Tree in the downstairs bedroom has blue, silver, and vintage style ornaments. 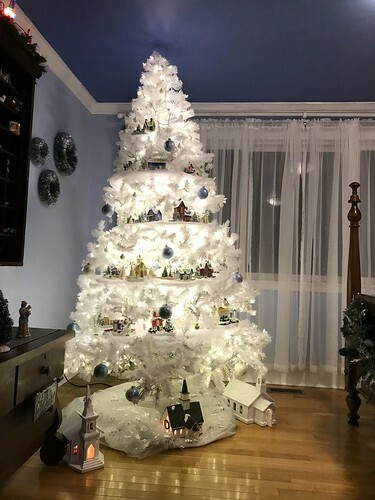 The green, artificial tree has been spray-painted silver to soften the green. I’ll stop here and will try to get a post about the Open House up soon!